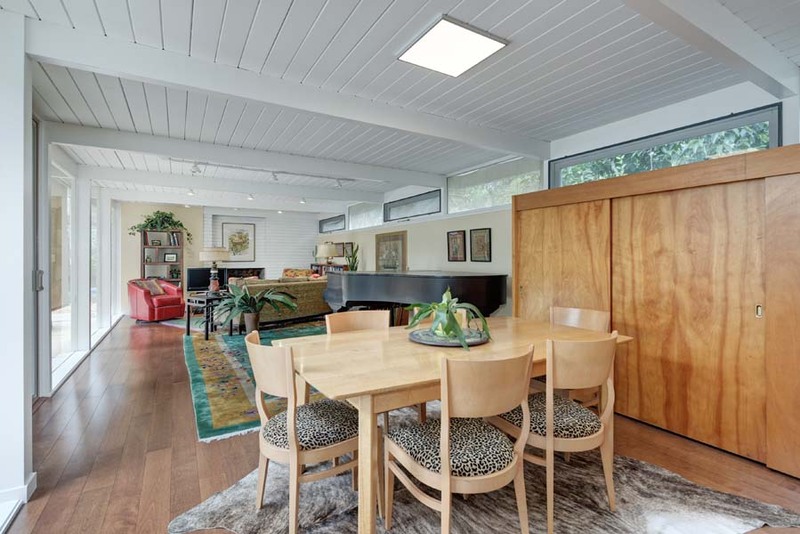 This Aaron Green (master-architect and Frank Lloyd Wright Associate), mid-century home was very small, with a living room/kitchen, 2 small bedrooms and one bathroom. 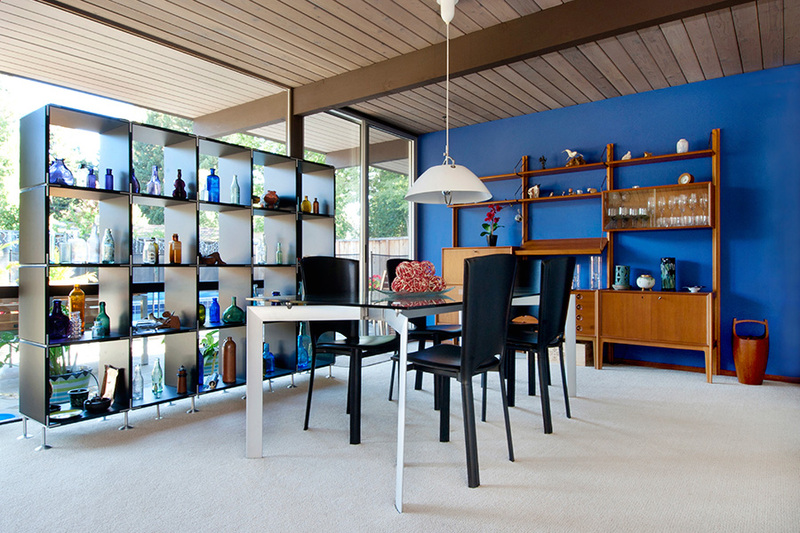 The 1950”s Eichler-type style included a lot of dark paneling, dark paint and dark linoleum tiles. 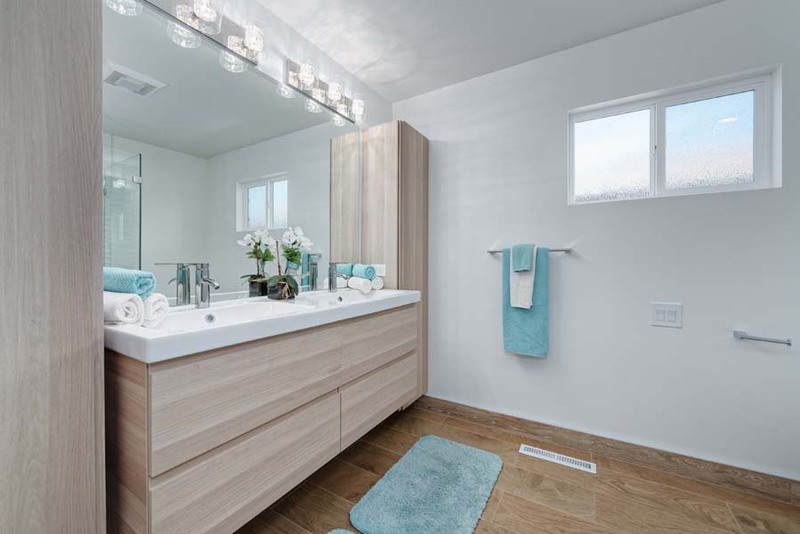 The bathroom was pink, white, blue and brown, It had no storage and again, there was only one. 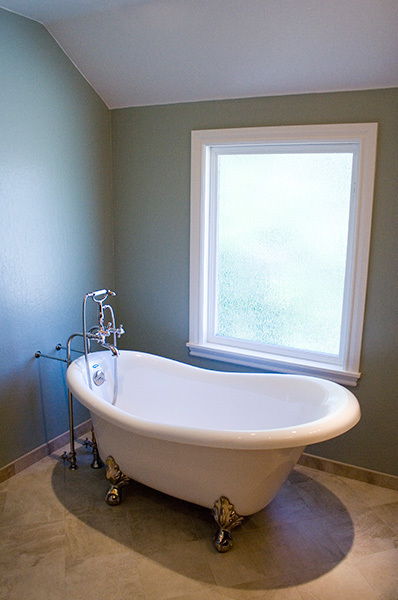 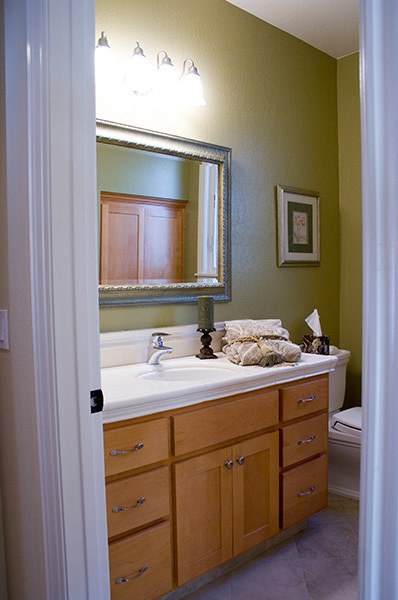 A larger master suite with a separate bathroom was added, the existing bathroom was updated and lots of storage added. 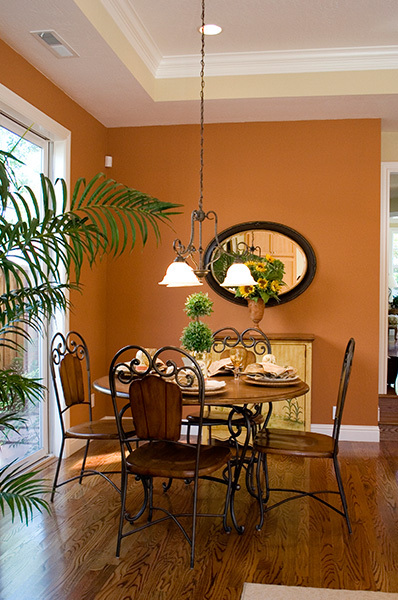 All the paint was lightened up throughout the home. 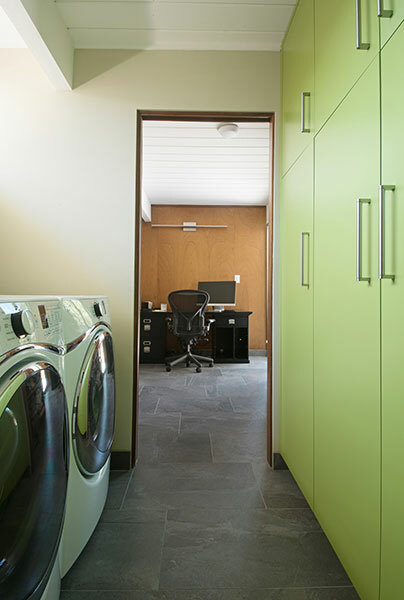 The living room and kitchen design created some separation between these area’s and even opened up some space for a proper laundry room. 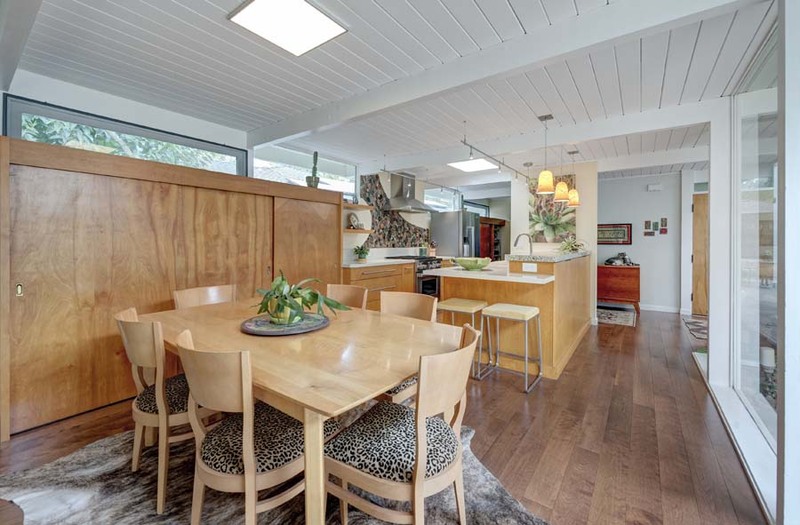 New hardwood flooring and wood cabinets (to match some existing that was saved) pay homage to the Aaron Greene original style. 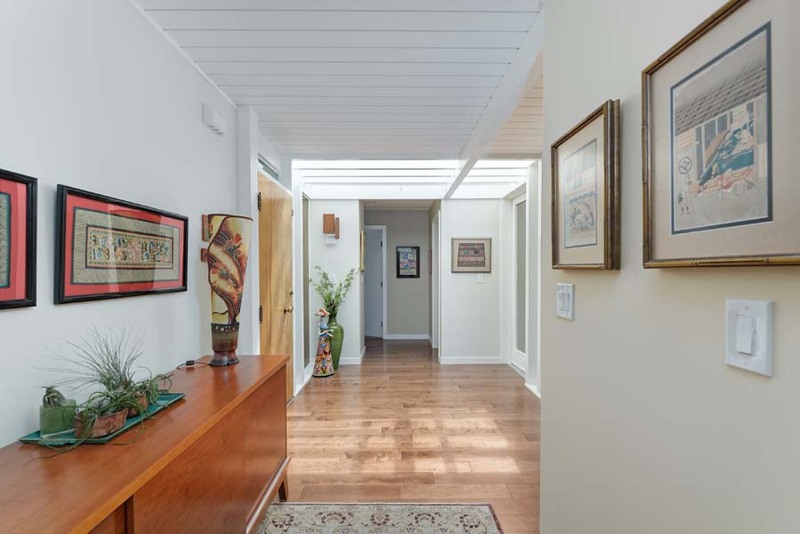 What was once a modest, tract house, with many walls cluttering up the space, is now an expansive, open house. 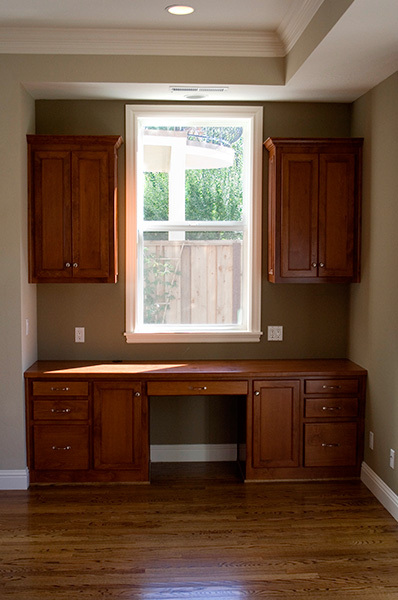 Our clients wanted a great area for their family to live. 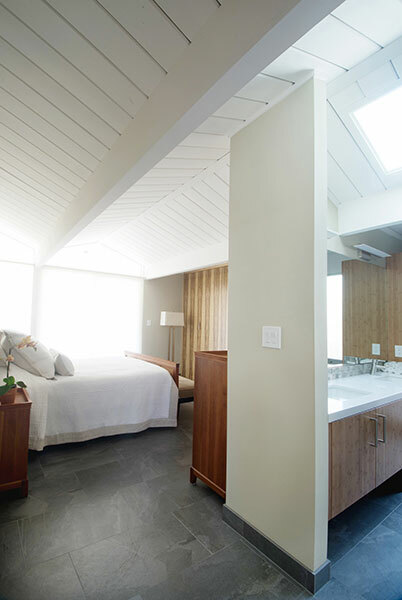 Vaulting the ceiling and opening up the walls create an unobstructive space. 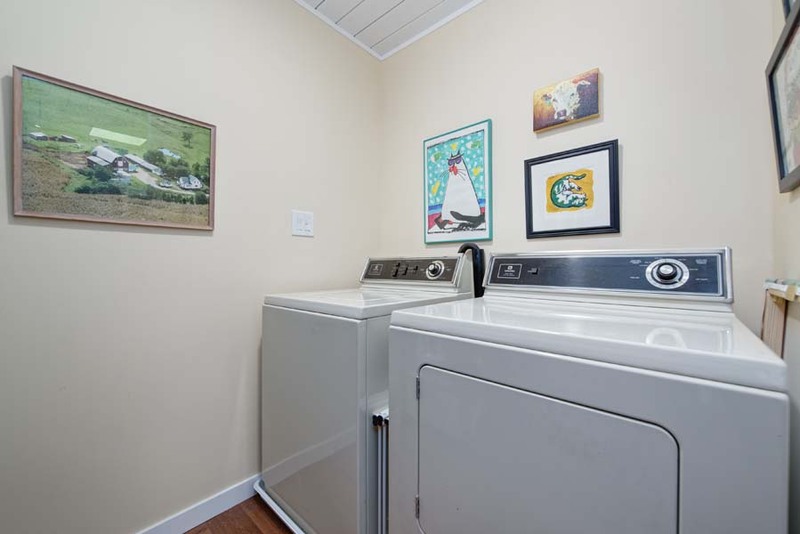 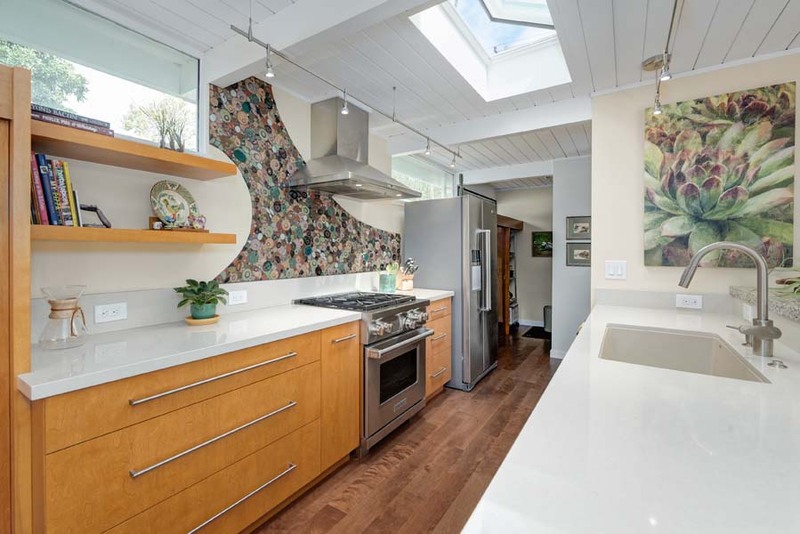 Clever features such as a 3-panel, large sliding door, 3 large skylights, streamlined cabinets and relocation the furnace and water heater contribute to the illusion of having more space. 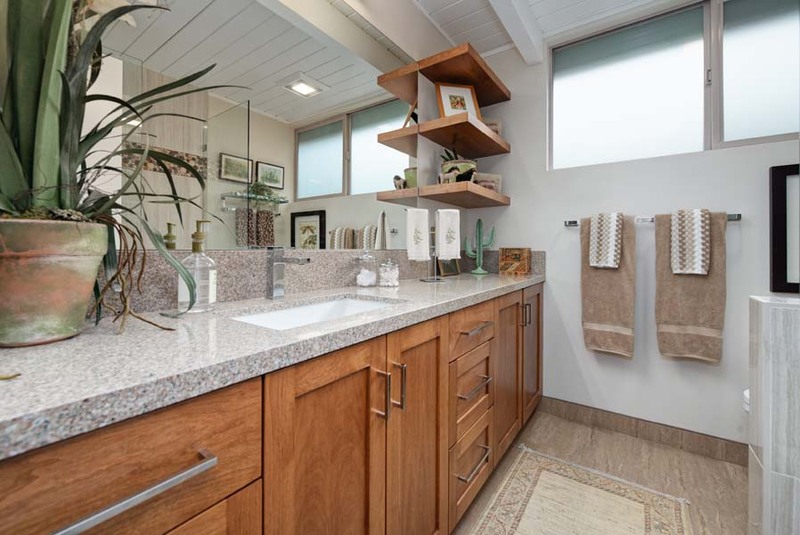 Updating all the bedrooms and bathrooms, with some slight reconfiguration, allowed for the addition of a half bath convenient for guests. 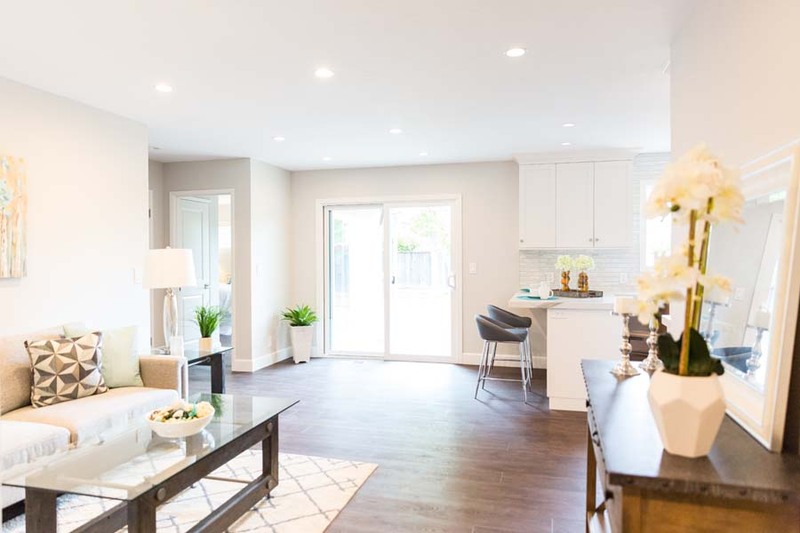 A small extension to allow for a formal front entry and an integrated deck in the back further extend this families living area making it truly great. 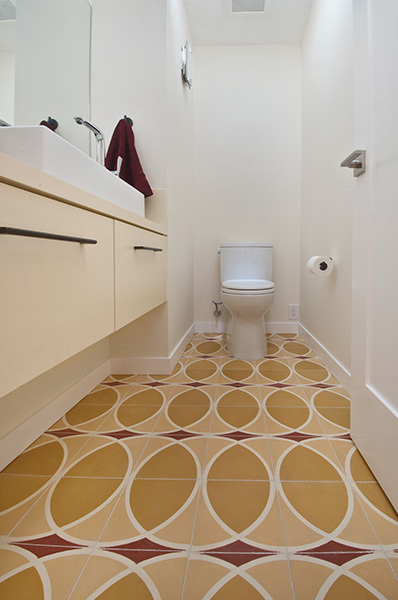 Bought as an investment home in 2016, this 1960’s house had pink everywhere-from the carpets to the wallpaper to the tile. 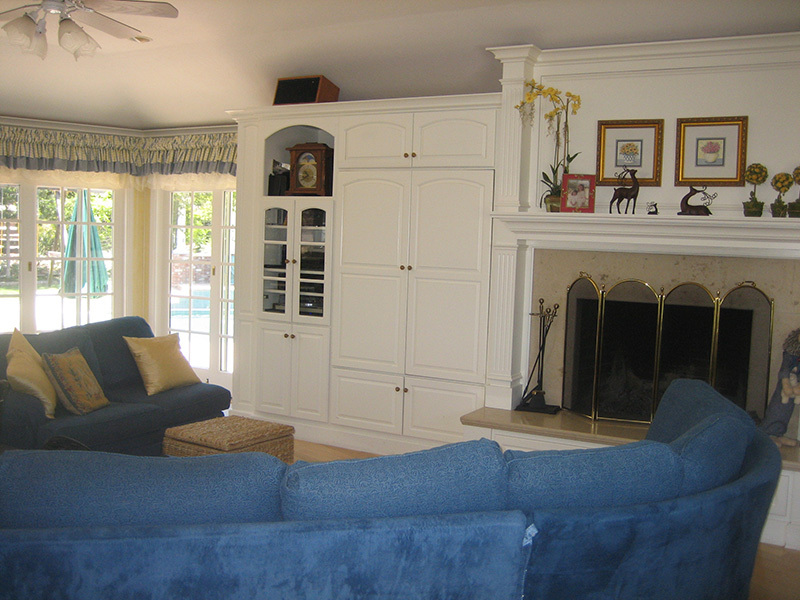 The living rooms were all closed off and in other area’s the space was used inefficiently. 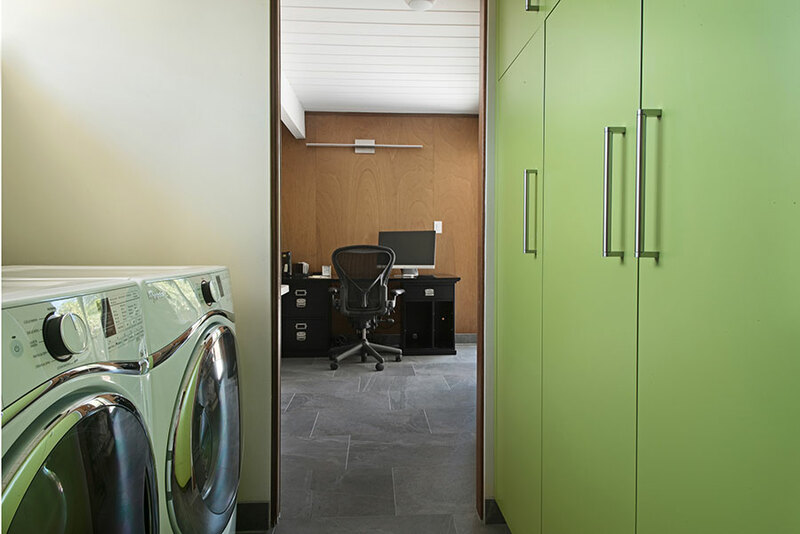 But by just widening the entries to the kitchen, living room and family room, eliminating the kitchen peninsula and reallocating inefficient closet space to both bathrooms proved to be just enough to make the existing square footage work for a 21st century family. 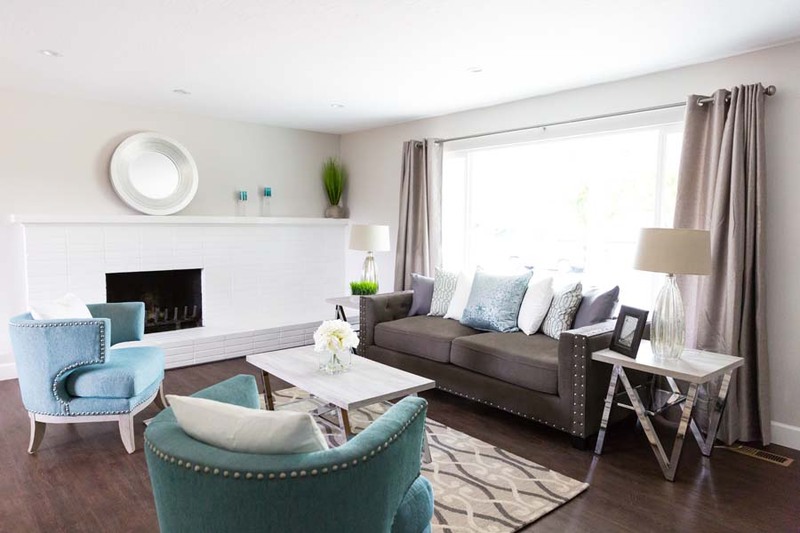 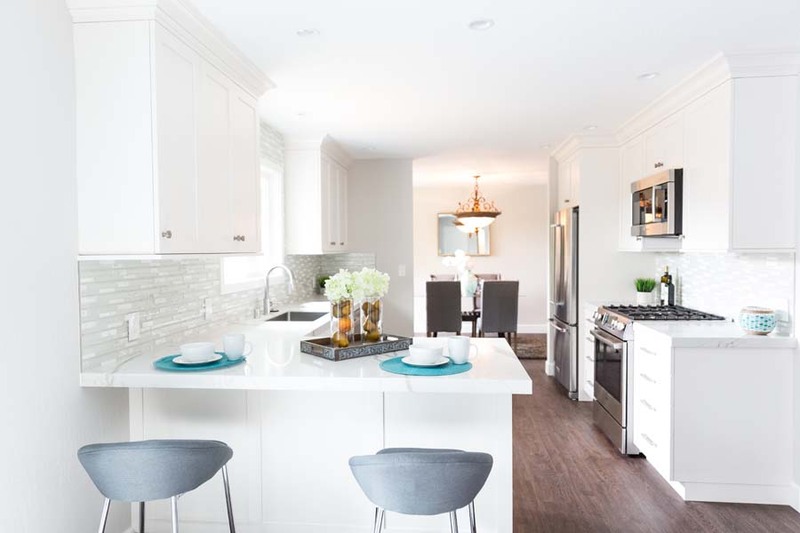 The entire home had a facelift (including custom accents fitting the location-custom cabinets, special tile and updated lighting-) all the colors were brightened up and kept neutral so any potential renter could spice the area’s up. 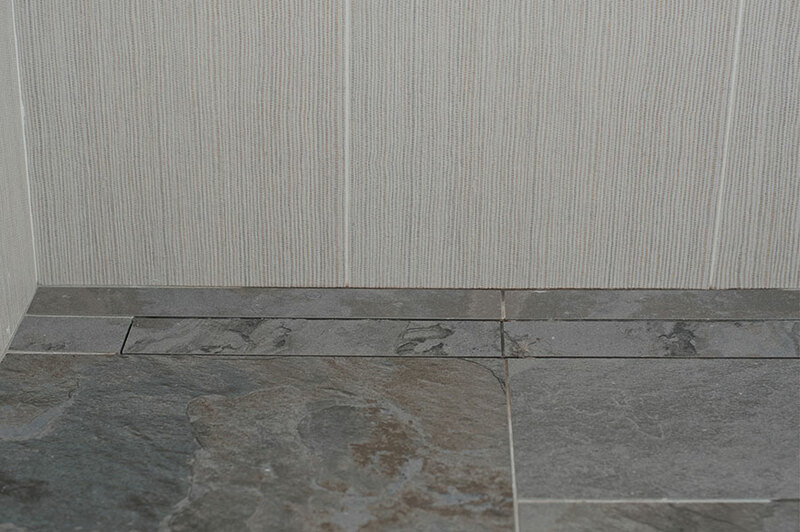 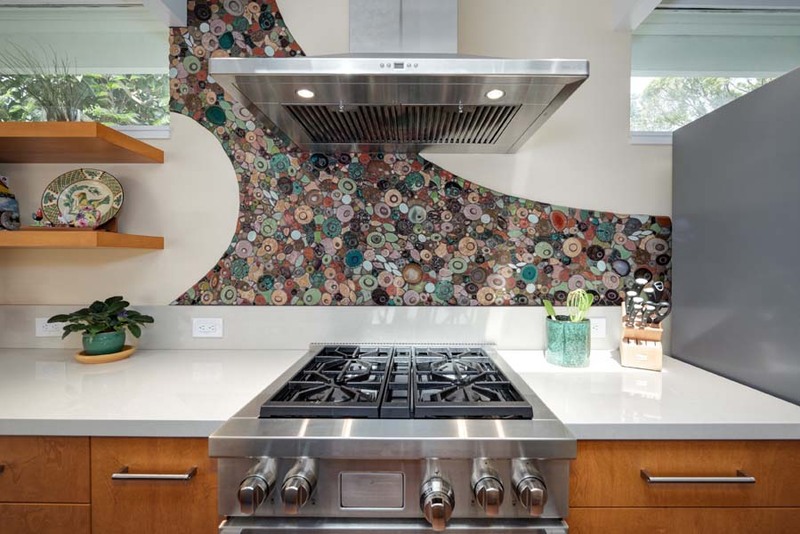 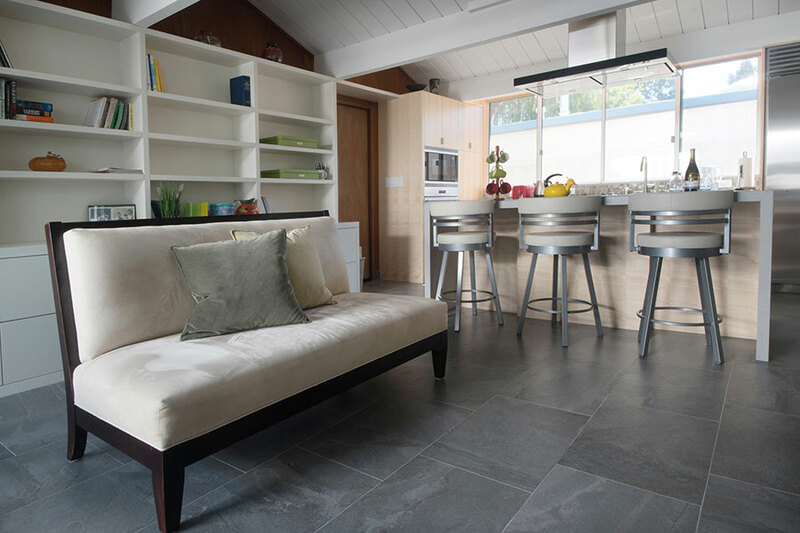 Conveniences of new, washable Durapoxy paint and easy to maintain pre-finished hardwood floors and quartzstone countertops contribute durability and ensure that this newly polished gem stays that way. 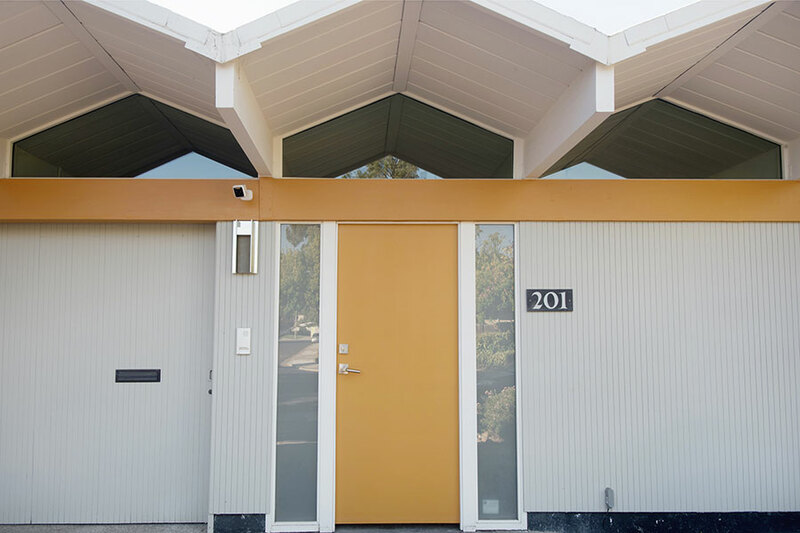 This new owner’s friends thought she was crazy to buy a new home, when she had just finished her existing home, but owning an Eichler was a life-long dream of hers. 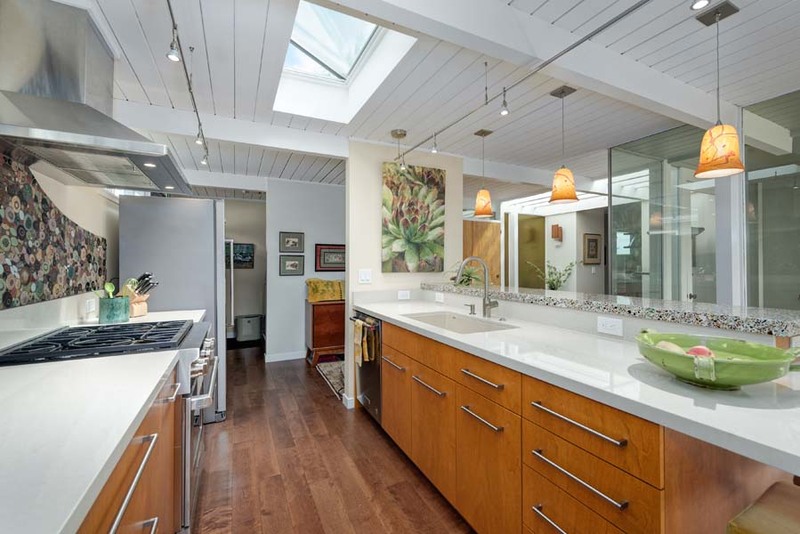 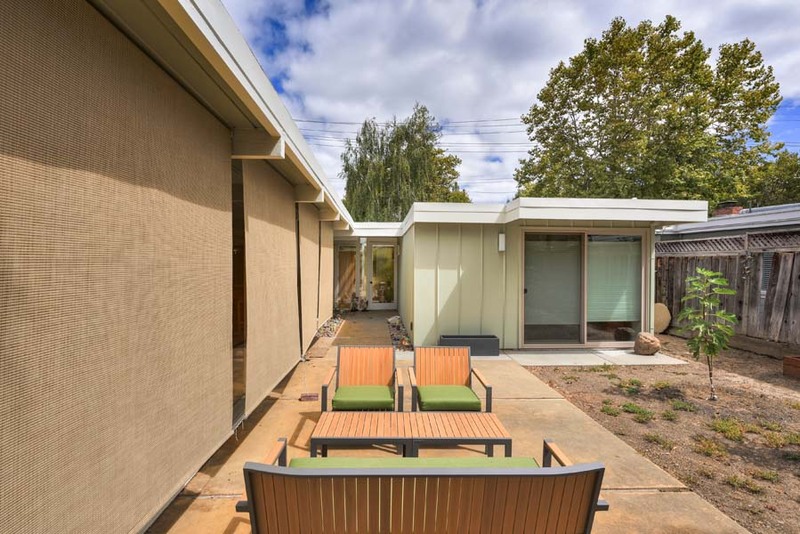 This Eichler was built by Joe Eichler, custom, for the sellers and they did not want a garage and had not remodeled (except parts of the kitchen). 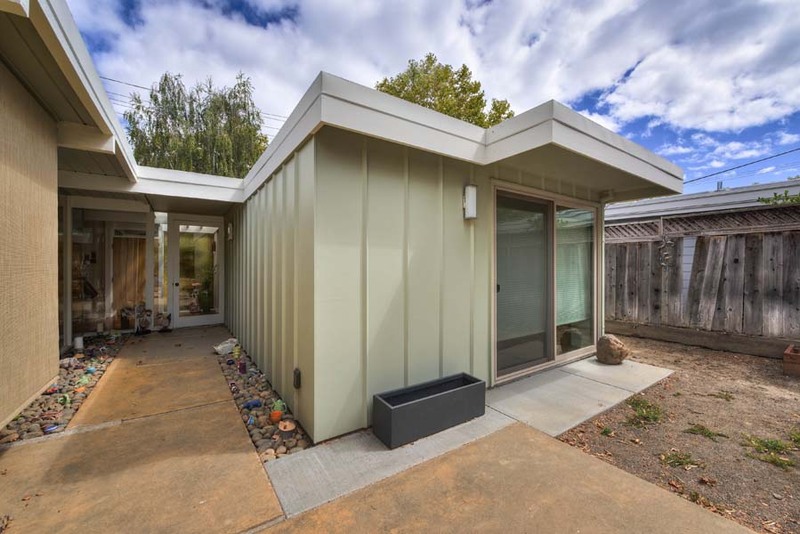 This entire home was remodeled to upgrade everything, and fit the Eichler style, custom to the new owner. 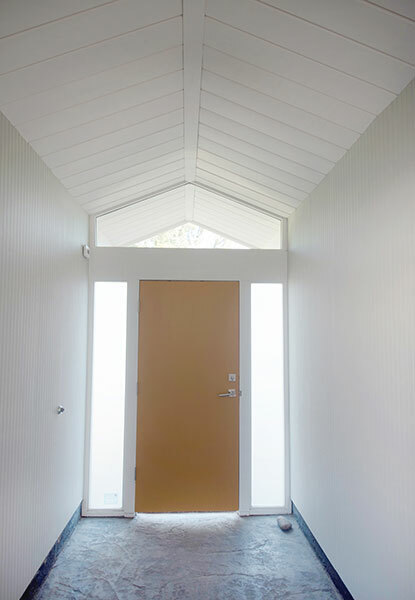 The garage was restored to a functioning garage. 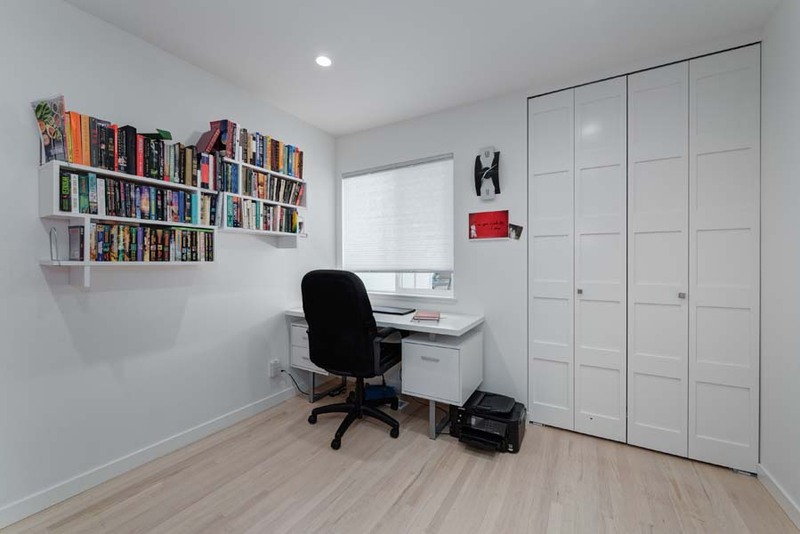 A room addition at the office added space for the owners prized book collection. 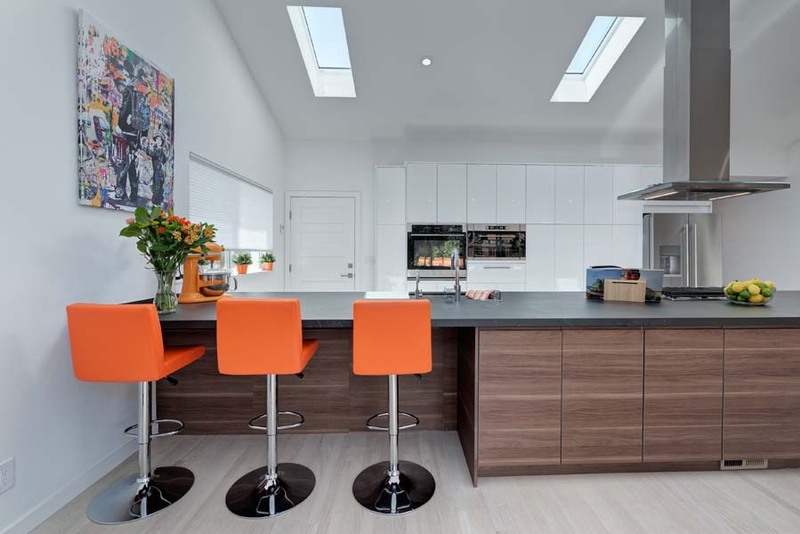 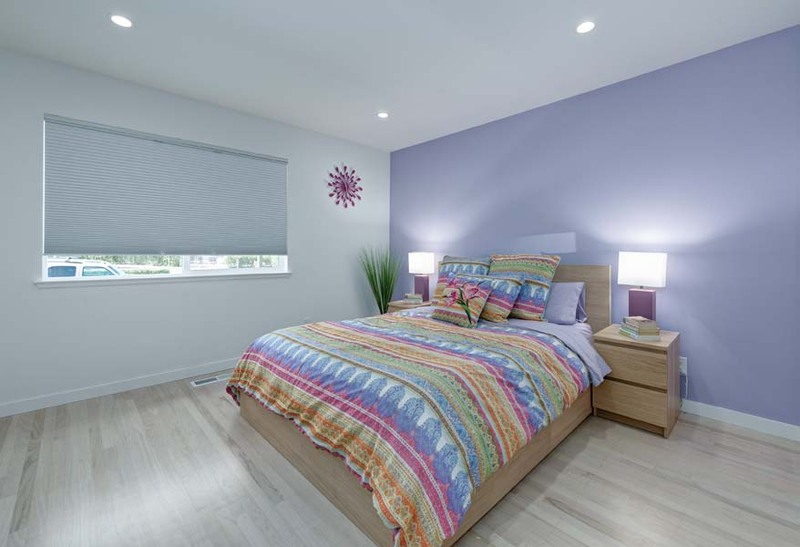 All the windows and doors were changed to double-paned for energy efficiency and were chosen to fit in with the contemporary style of the house. 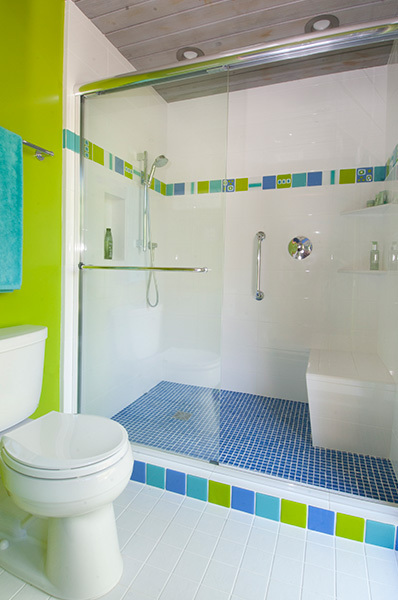 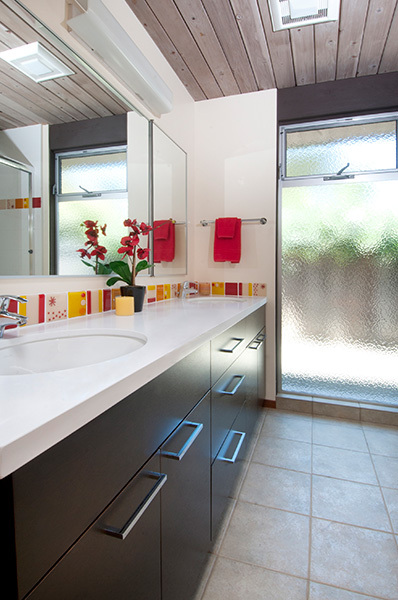 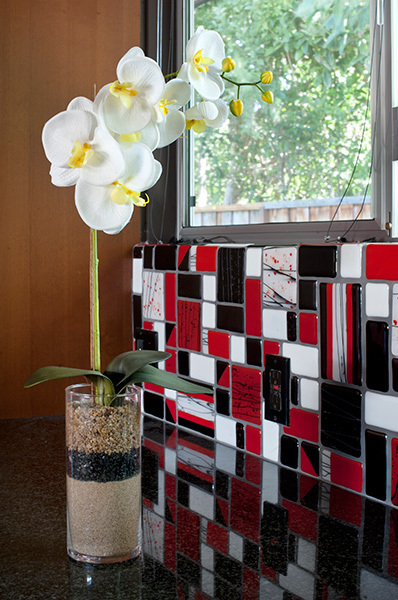 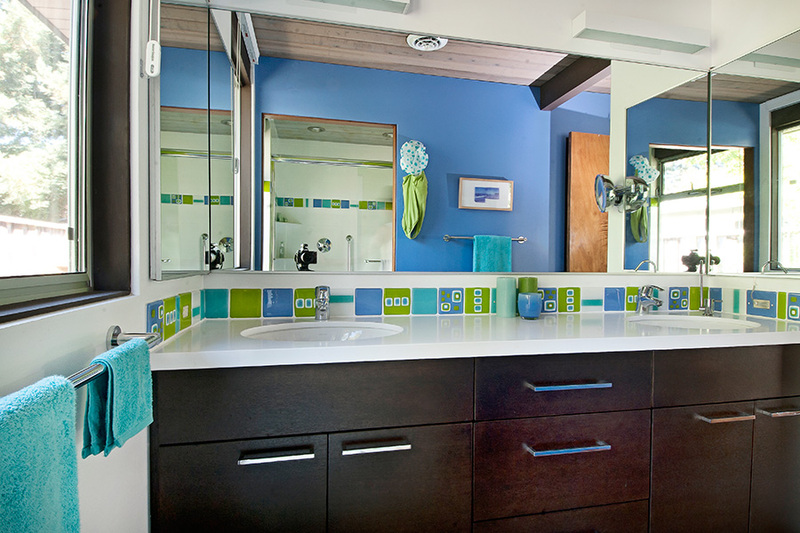 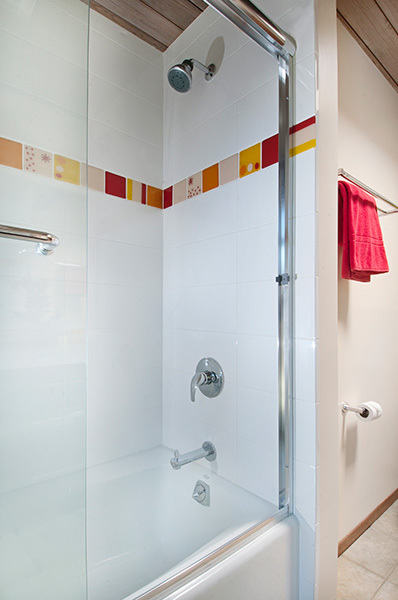 The original bathrooms were upgraded with colorful handmade tiles, giving them a fresh, modern look. 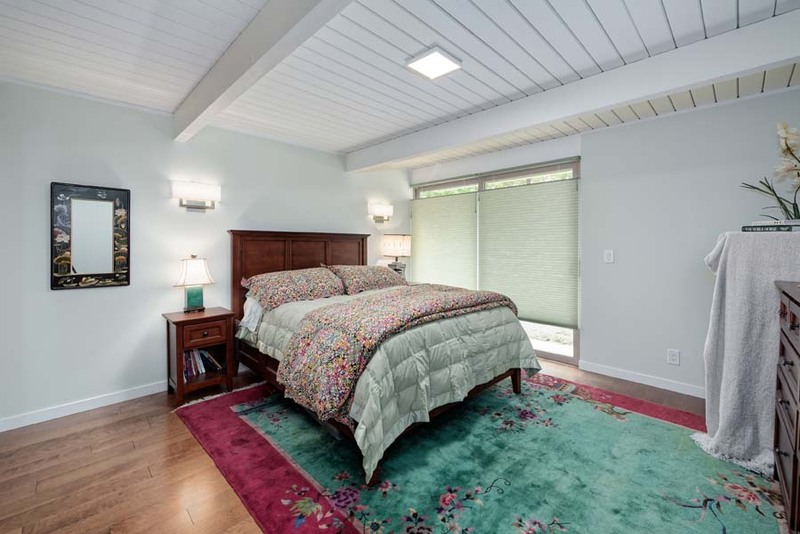 All the other rooms in the house were refreshed with bright colors, new flooring and new stained wood base (just like the original base). 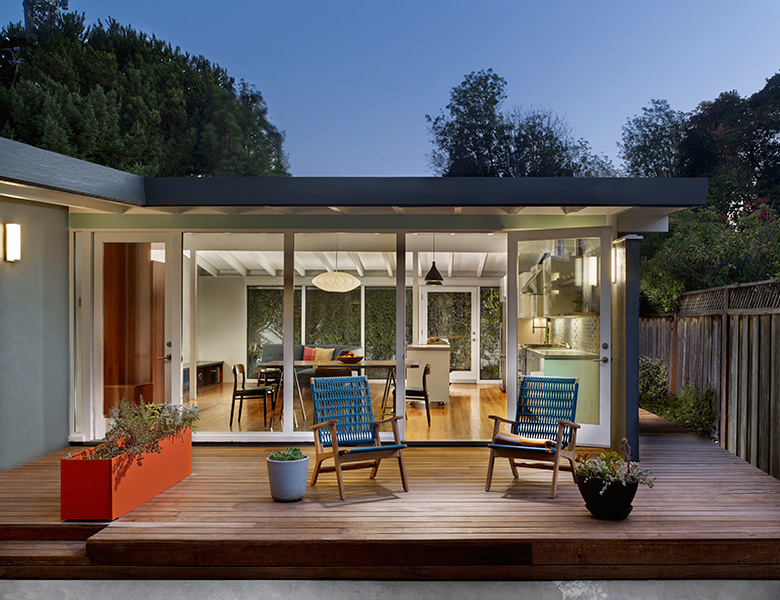 The icing on this Eichler cake was the updated landscaping. 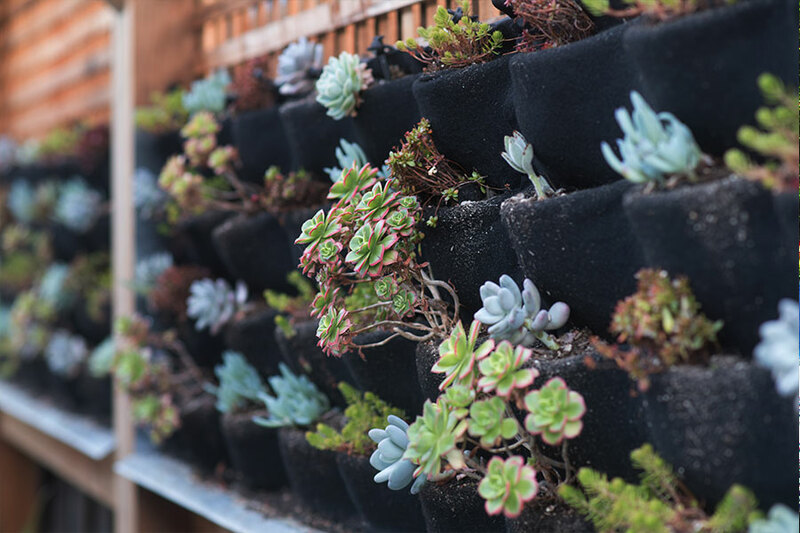 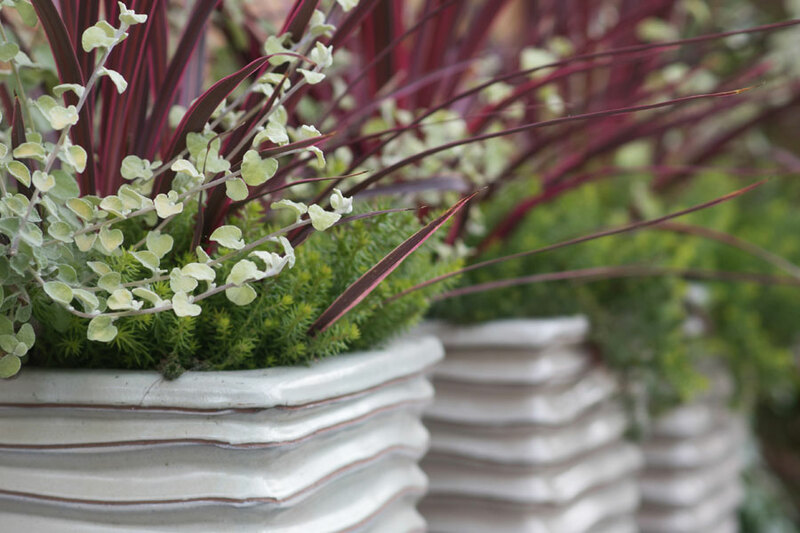 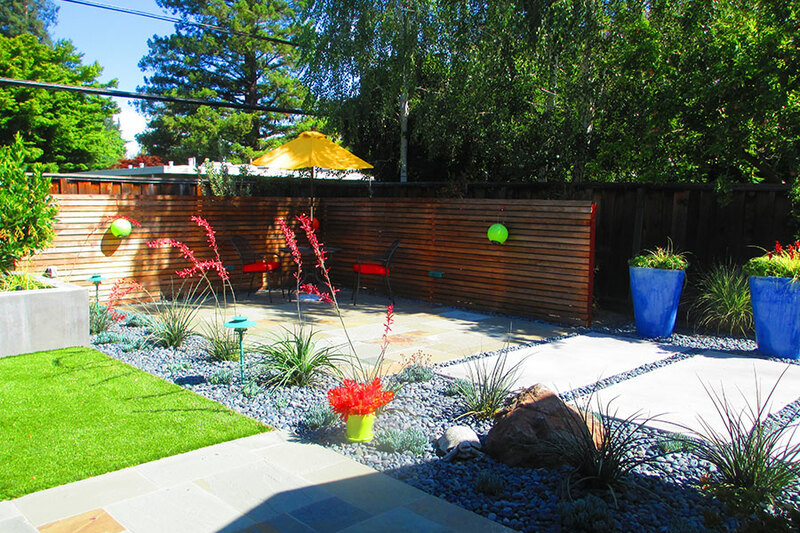 Both the front and back yards were given an up to date look with modern blocks of concrete, colorful slate tiles, planting boxes, new plants and a Field of Greens lawn. 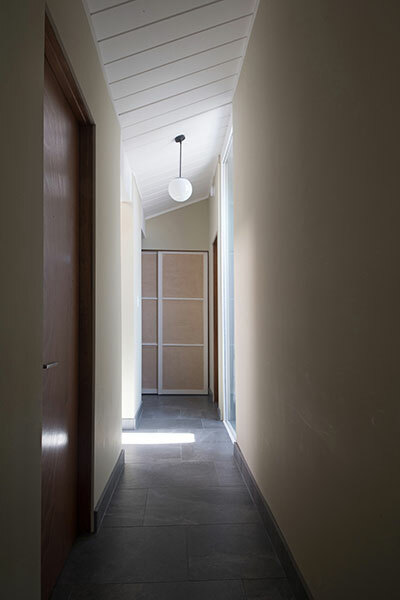 Hidden lighting in the concrete blocks and a pop of Eichler red at the door and mailbox really bring this home to life. 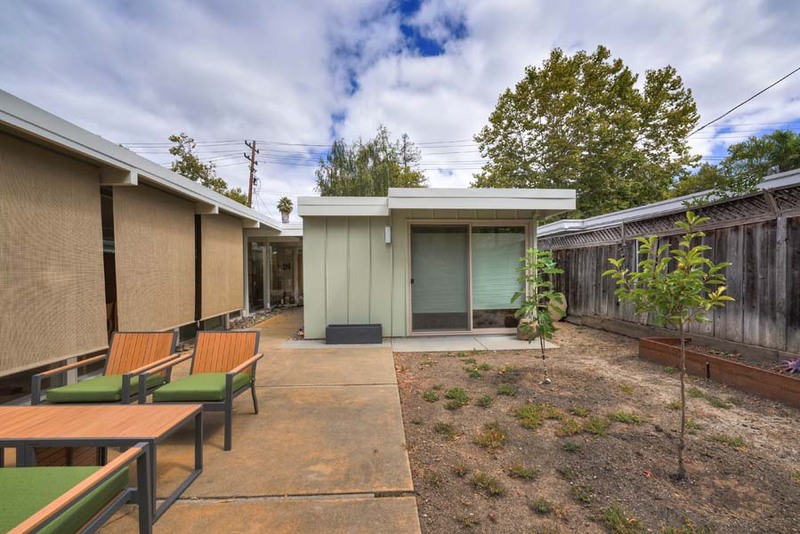 Tag Words: Eichler, Addition, Bath, Bedroom, Living, Modern, Landscaping, Los Altos. 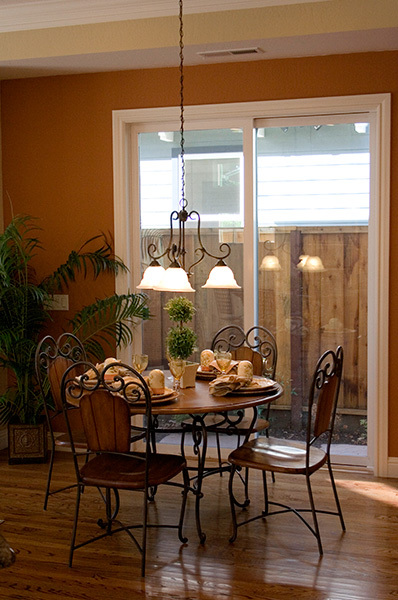 This beautiful estate in Parker Ranch did not always look this way! 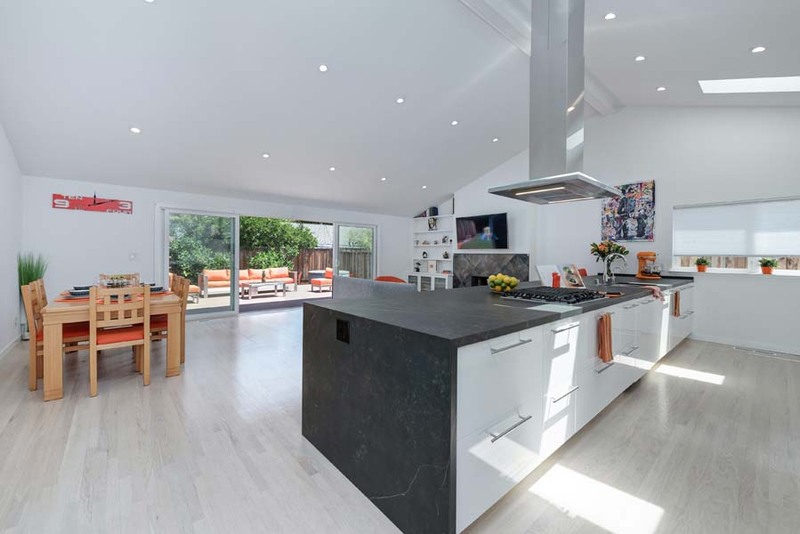 The hillside was sliding into the house, the formal front door was too far away from the kitchen, living and dining area for this busy family and they needed more space for activities. 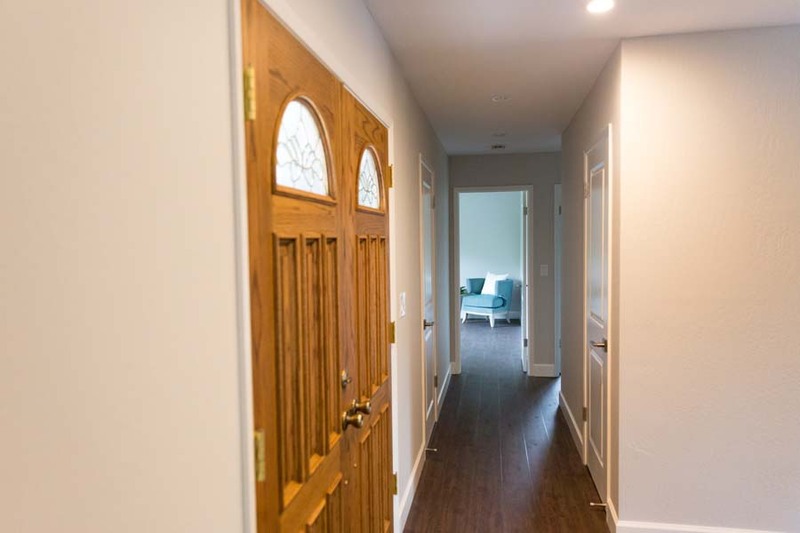 After securing the hillside and landscaping the backyard, the side yard and part of the front yard, a new side (front) entry porch was added to make things like carrying in groceries more convenient for them. 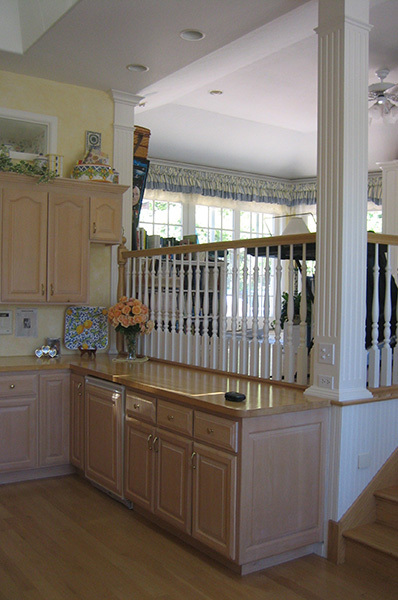 The kitchen was too small and didn’t fit with the Colonial style of the home. 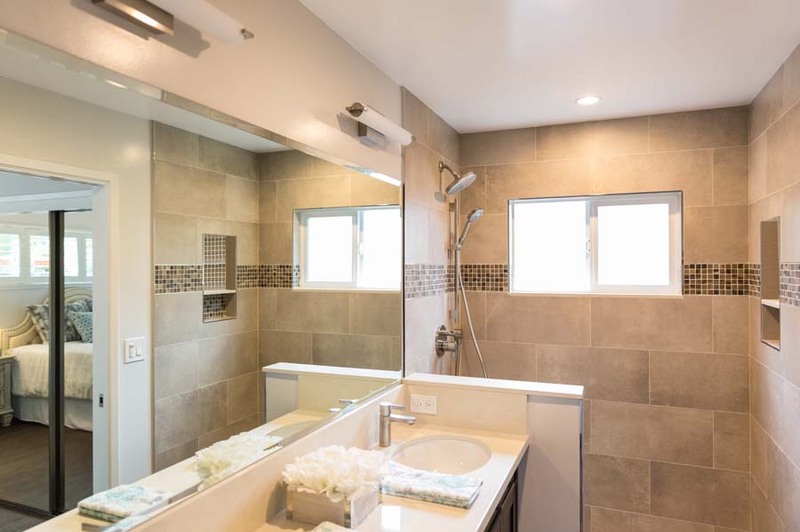 It was updated as well as a bathroom off of the kitchen (and for the pool). 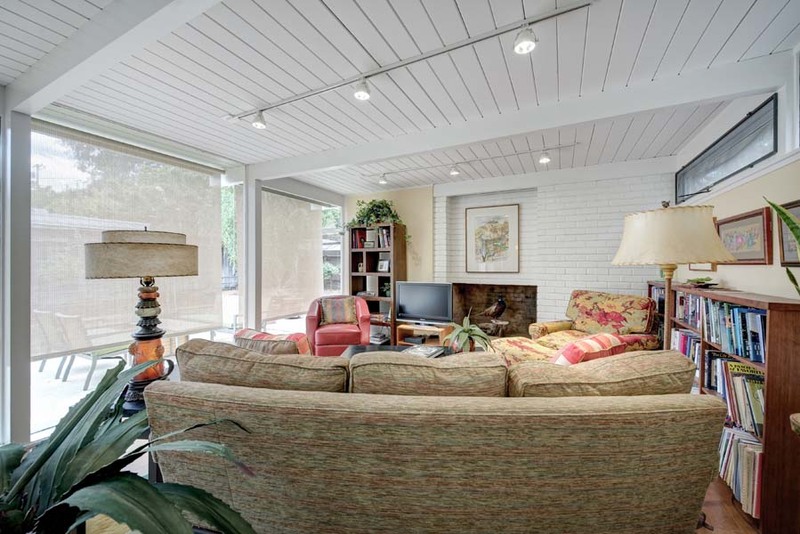 A living room/family room was made larger, again to fit the large atmosphere of the design and a secret wine cellar was installed, like during prohibition. 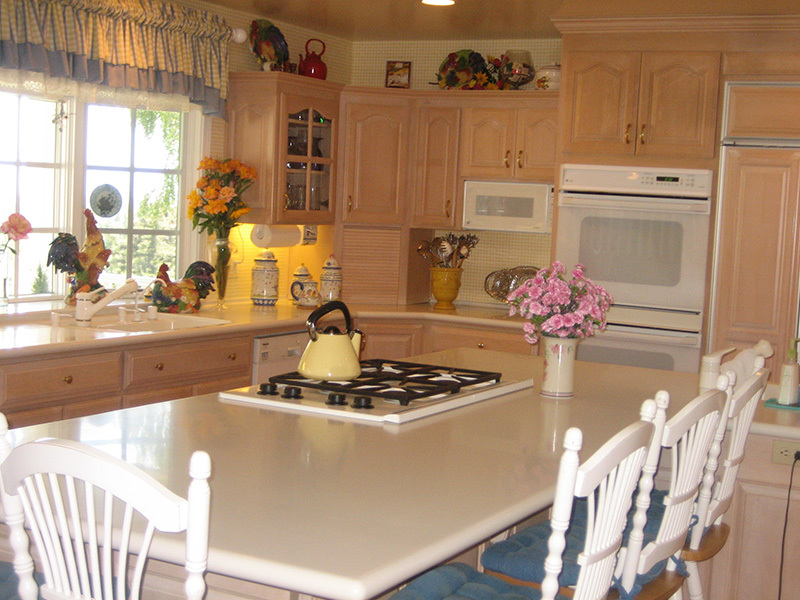 This project was done in the early 90’s. 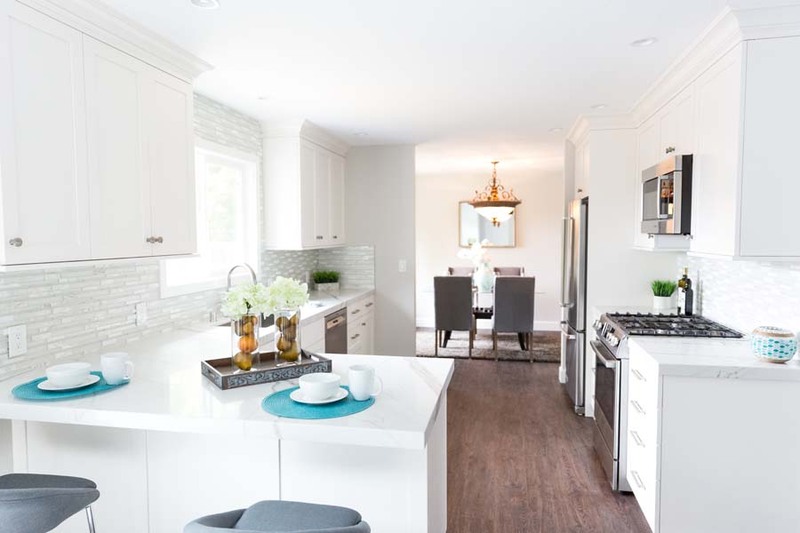 Custom cabinets, Corian countertops, wood floors, new tiles, wallpaper, bead board and a new fireplace created this cozy, then popular, updated colonial, country kitchen. 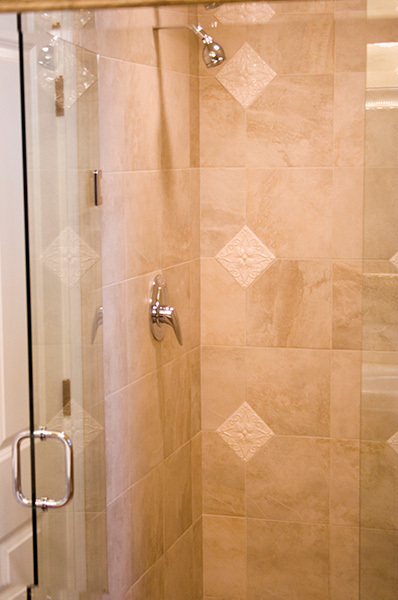 The pictures you are viewing were taken approximately 17 years after this project was completed. 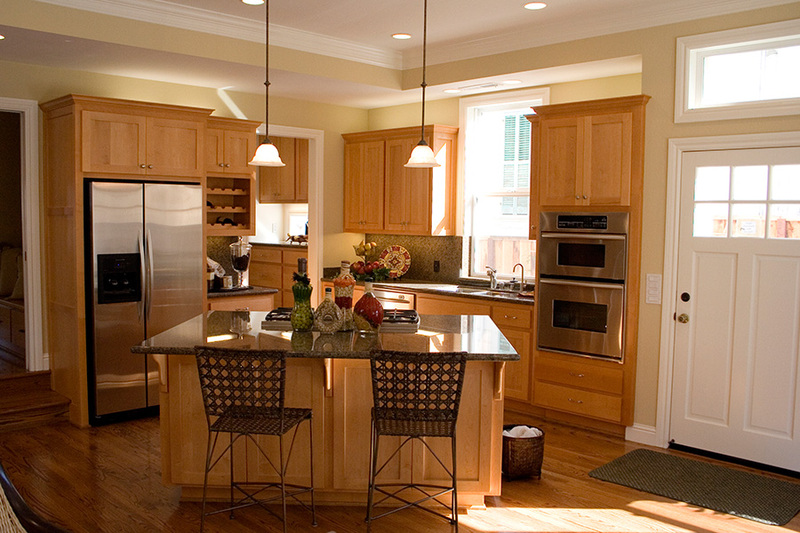 Everything looks new though, perhaps, a little dated. 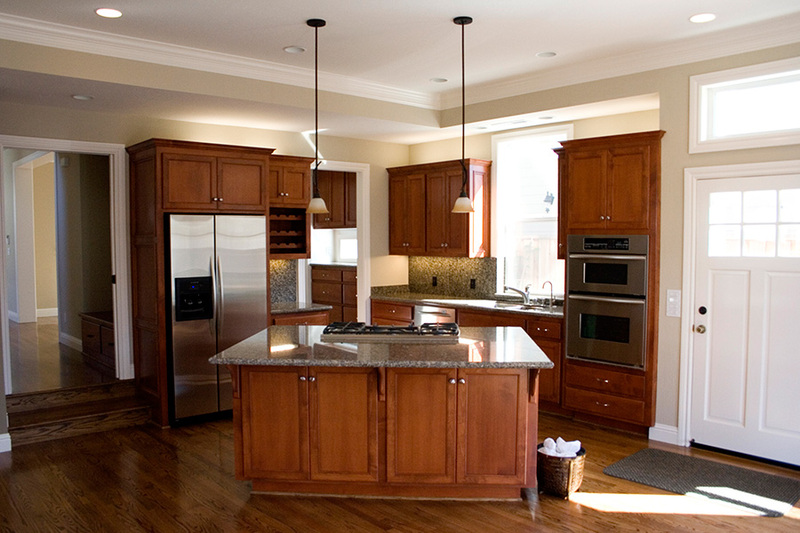 However you can see that a proper remodel project should last a lifetime (with proper maintenance). 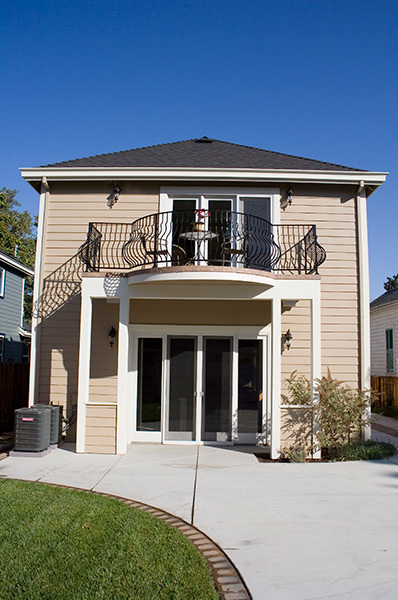 The final aspect of this project was to add an exterior living space. 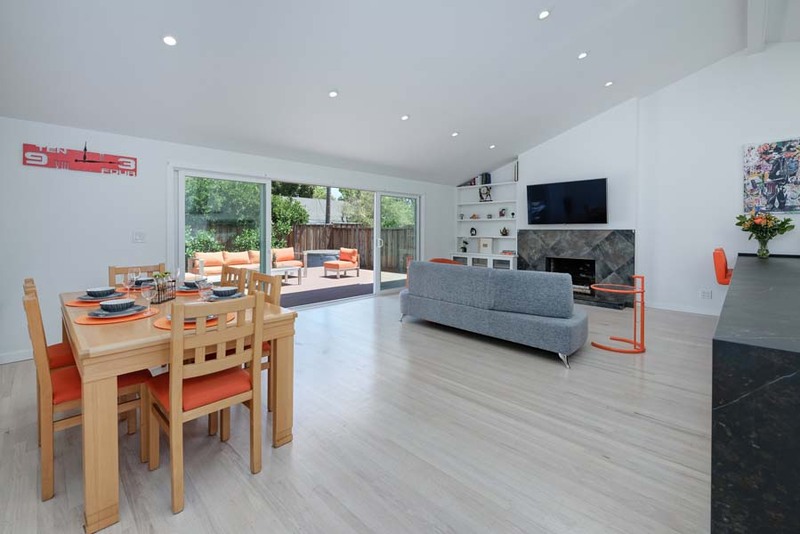 This was accomplished with partial screened walls, lighting, fans and outdoor flooring. 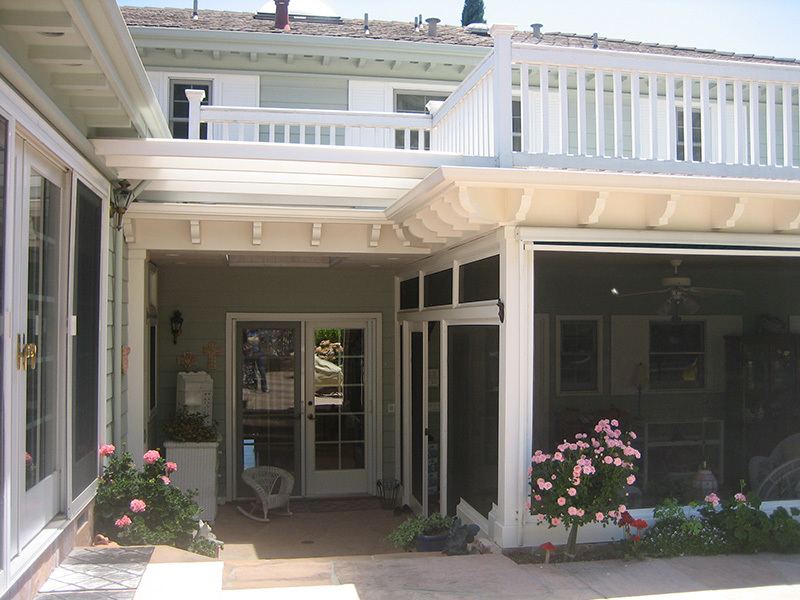 The back porch was added to blend in with the house and look as if it had always been there. 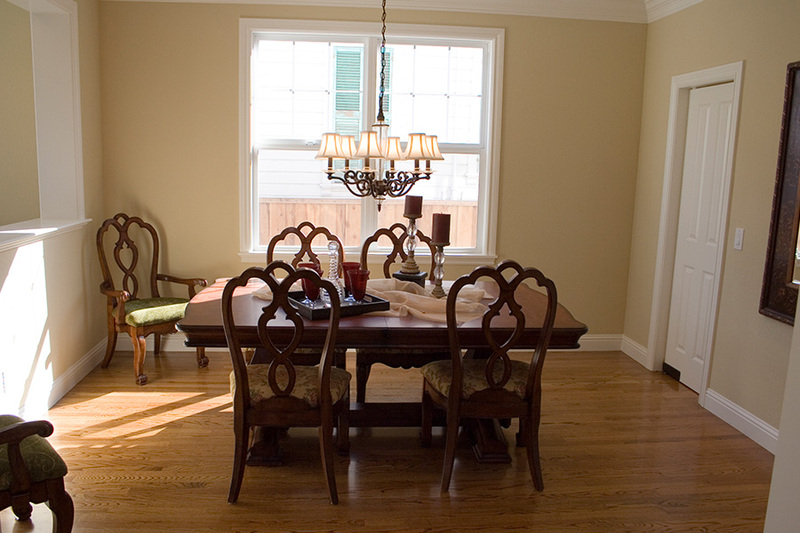 The final product suits the grand style of the house and the family perfectly. 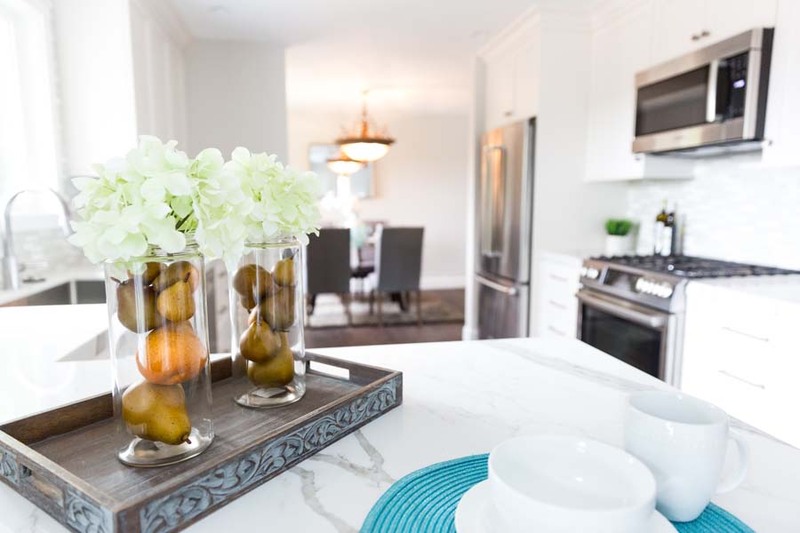 Growing her own grapes to make wine, store it properly and prepare gourmet tasting meals in her own home was this professional chef’s dream. 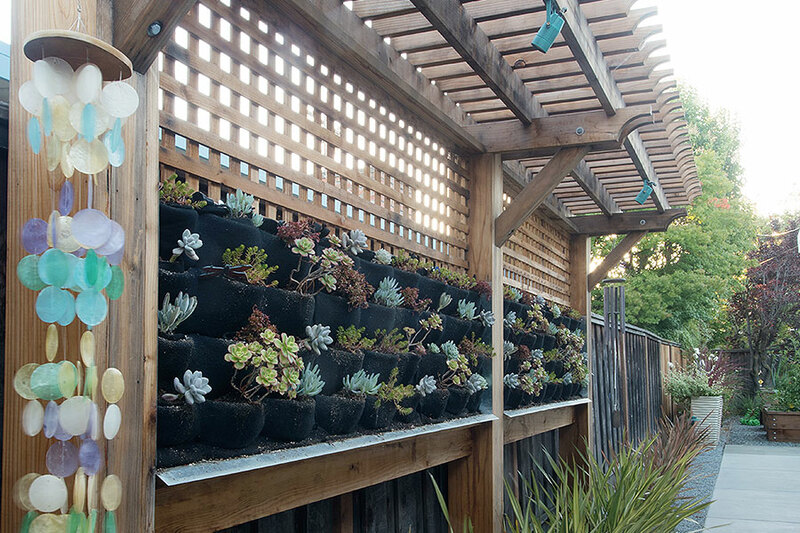 If that could happen while enjoying our lovely San Jose weather-all the better. 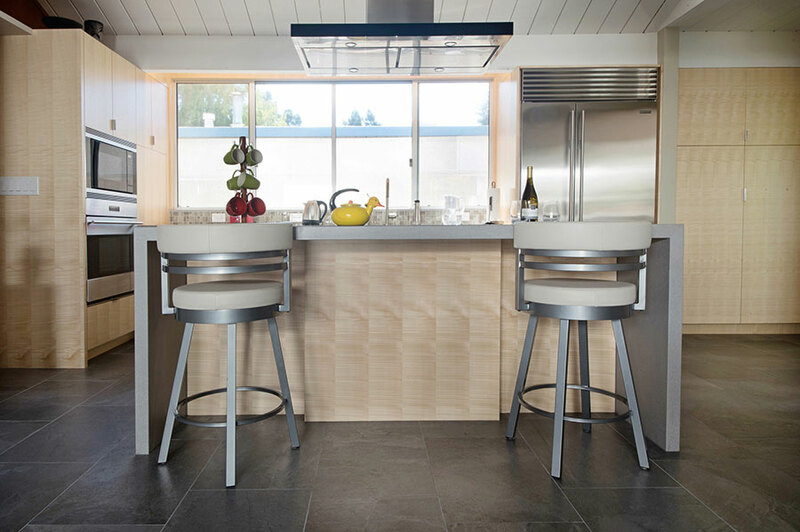 An outside cooking, entertaining area with wine storage underneath was the perfect solution. 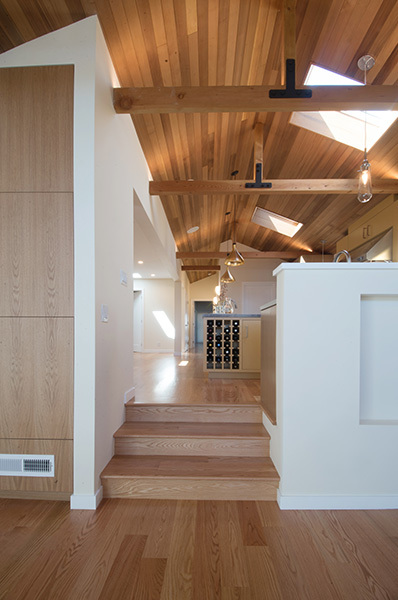 A wine cellar was dug out of the land behind the house and a new deck was framed at the door level height, allowing for wine storage below. 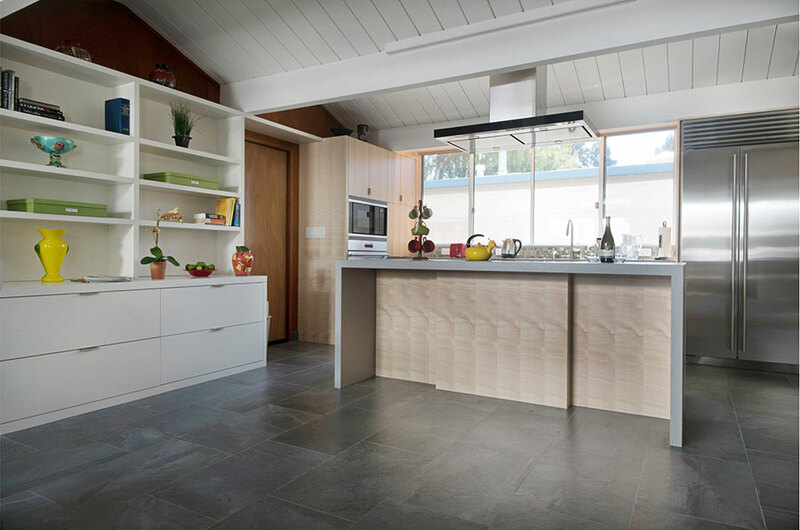 The deck included a new outdoor kitchen with a granite bar top. 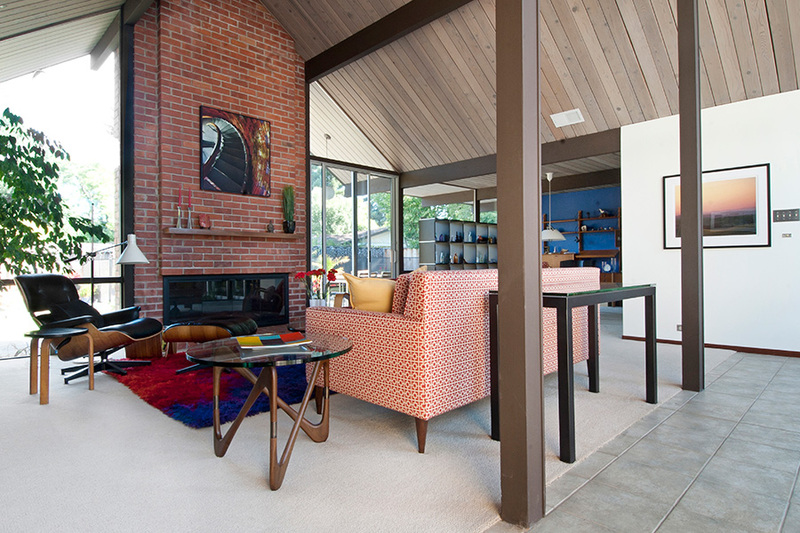 The design incorporated curves to match the houses arches throughout (see in the windows) the existing house. 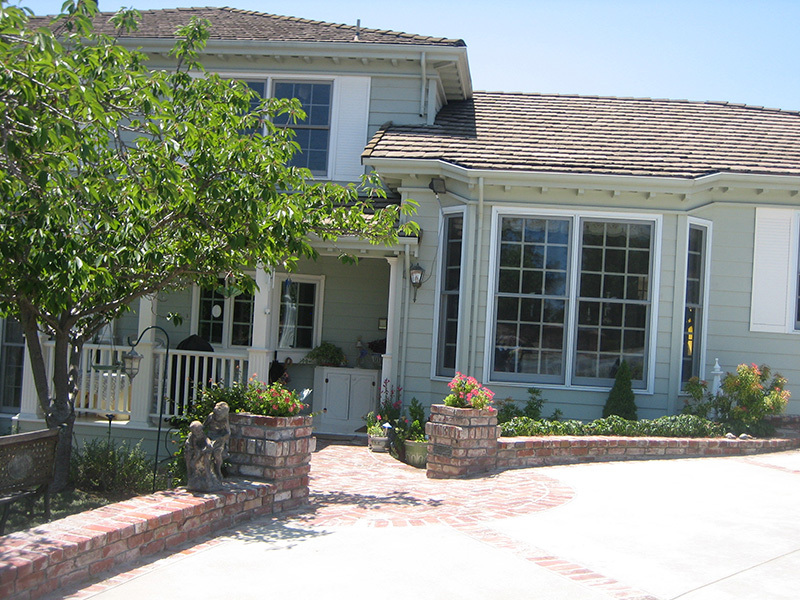 Curved stucco, to match the existing house, makes this area look like it was always there. 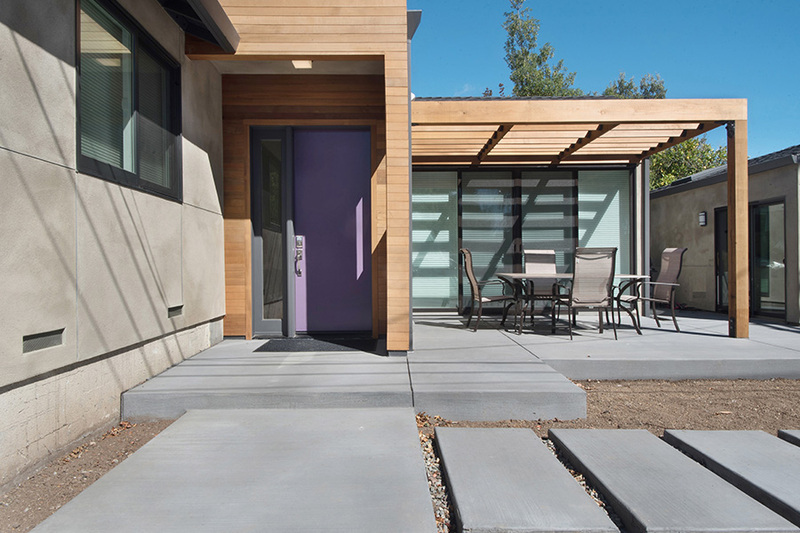 Concrete steps and sidewalks colored to match the existing with new lighting (special inset lighting at the steps) and a sun shade for hot days make this area useable all the time. 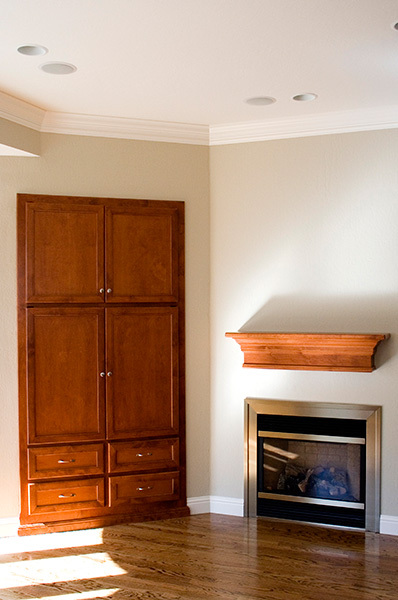 The wine cellar has proper ventilation and thermometers to ensure that the home-made wine will stay fresh and age appropriately. 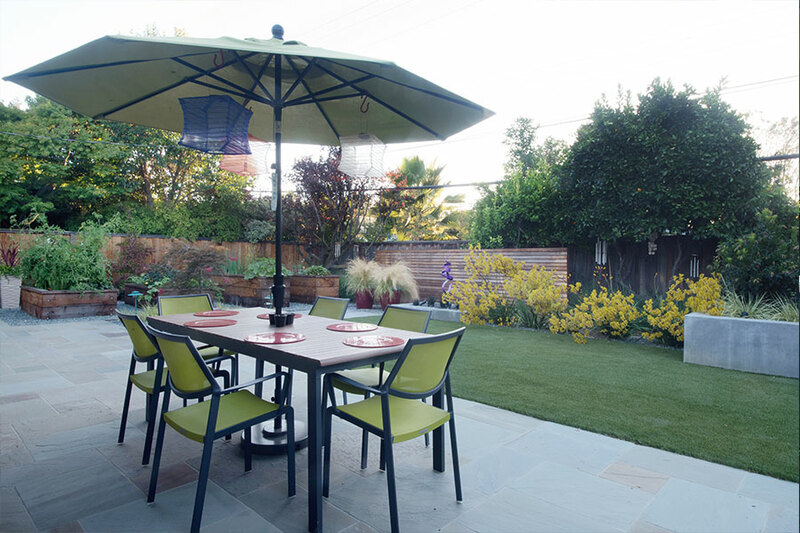 The owner has her outdoor space to enjoy her home and spoil her guests. 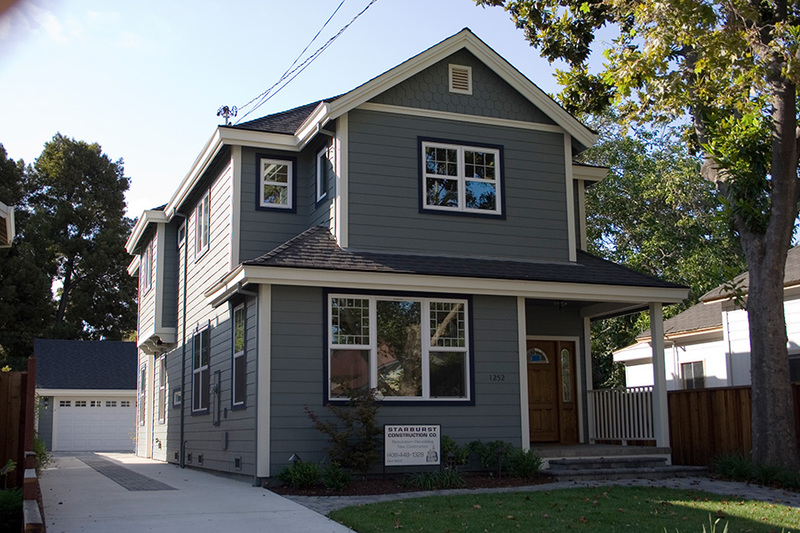 Two beautiful craftsman homes designed to match the neighborhood. 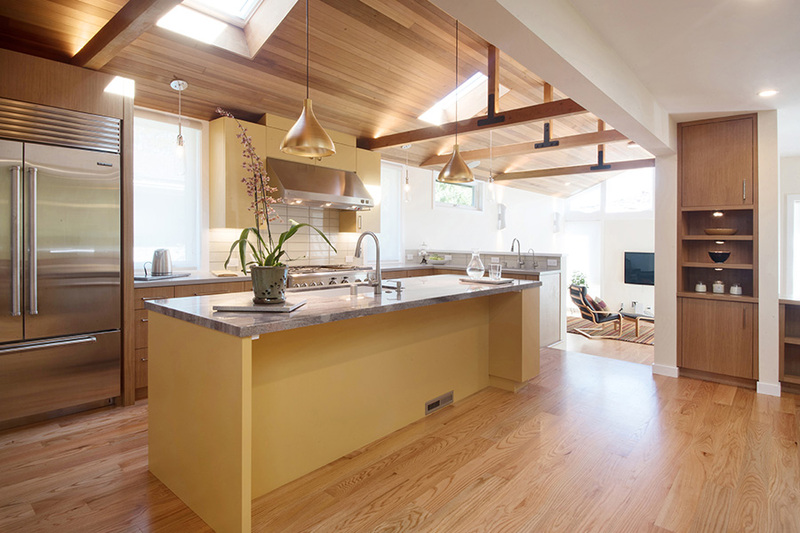 Both homes were designed with families in mind. 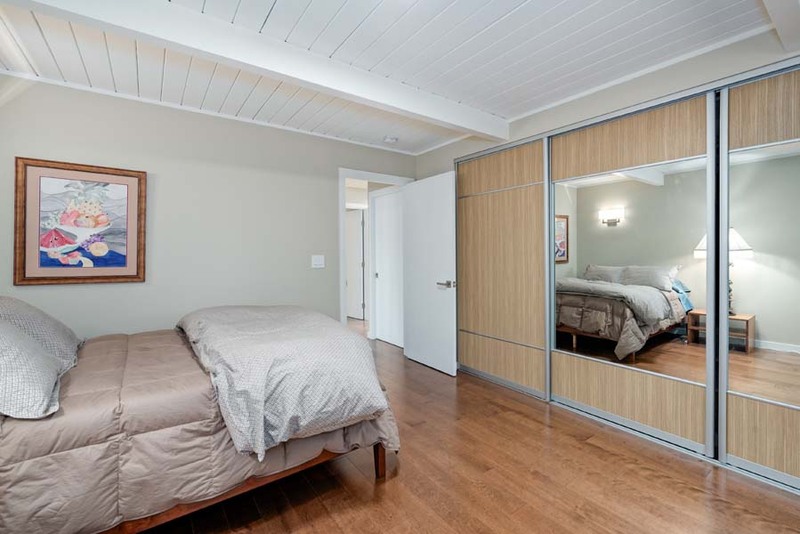 They were 2400 square feet and had 4 bedrooms and three bathrooms. 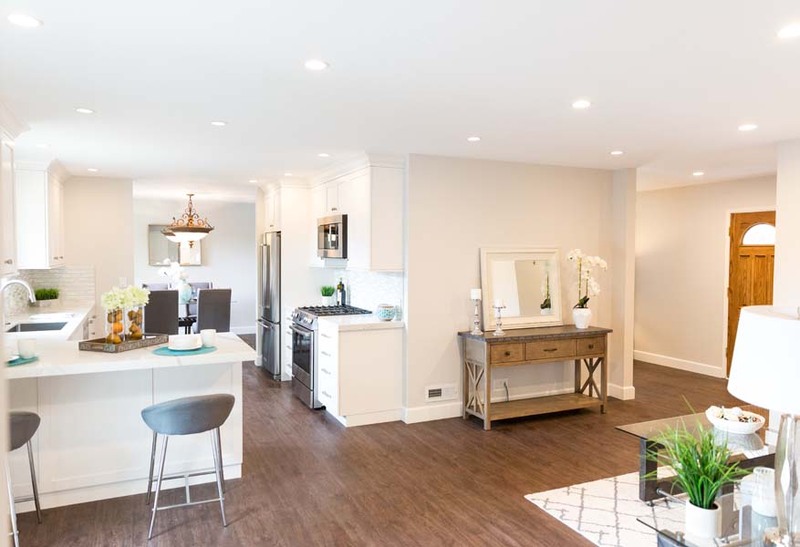 The open, kitchen and family rooms provided plenty of space for family activities, while a more formal dining and living room gave space for separate entertaining. 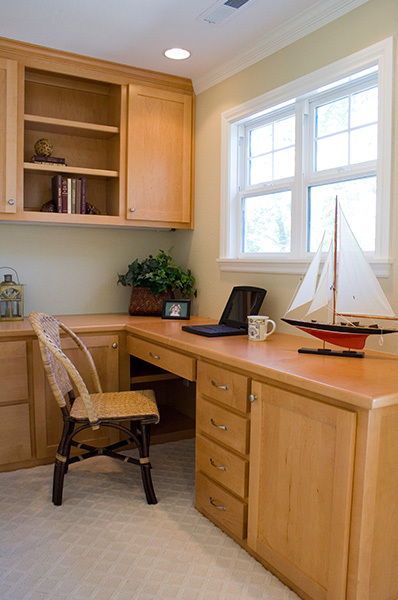 The living spaces on both homes were upstairs and included a desk/office nook and a private deck off the master suite balcony. 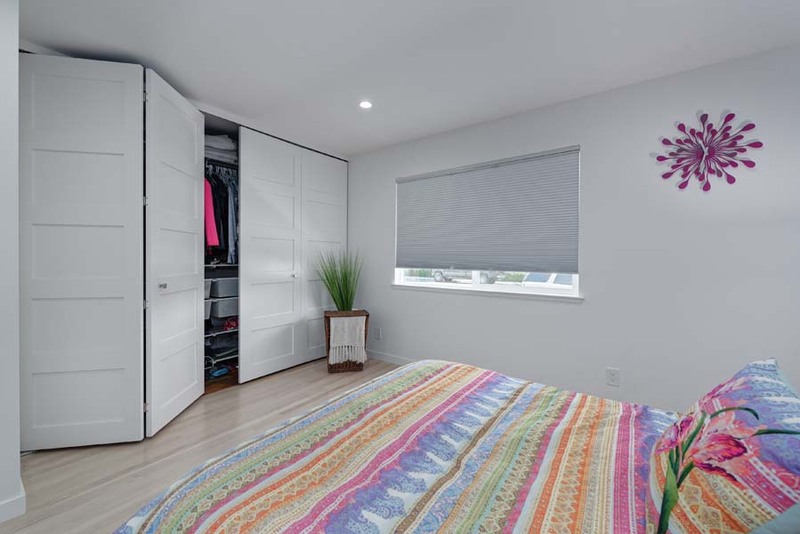 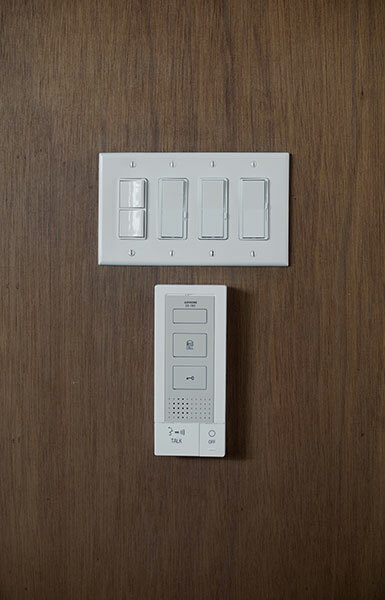 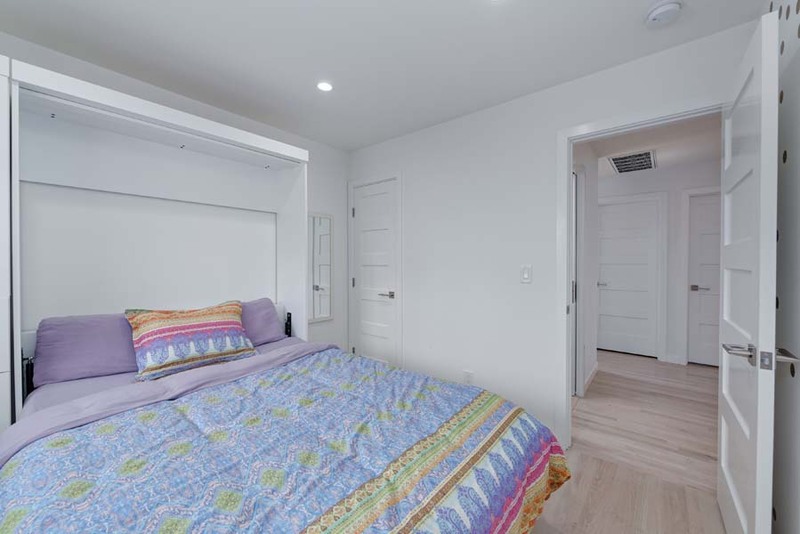 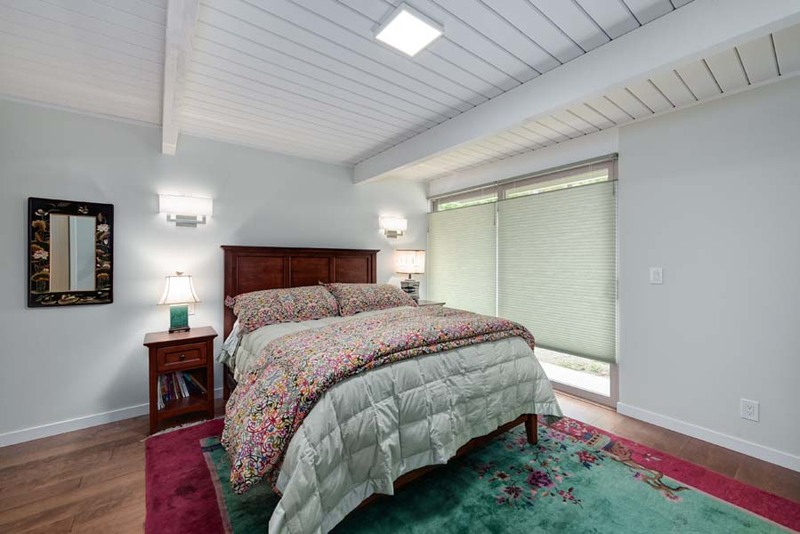 An update from original Craftsman homes was the large walk in master bedroom closet, complete with a data hub for all of our technologies of today. 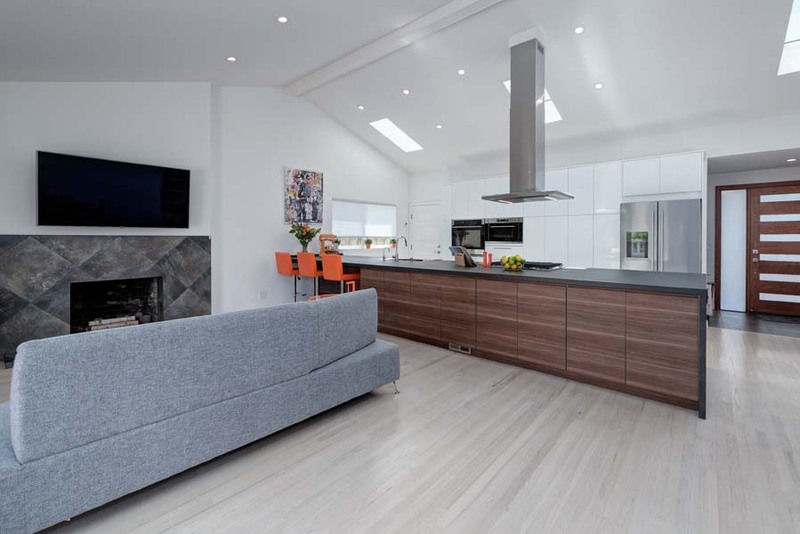 All the finishes were chosen to fit the style of the house and the neighborhood; hardwood floors, tile, granite, semi-custom cabinets, wood railings, carpet and plumbing fixtures including a freestanding tub. 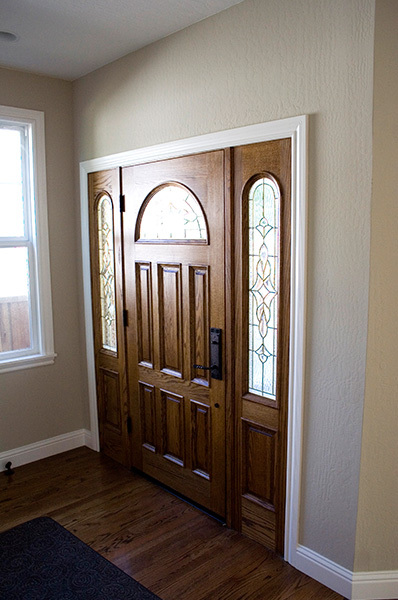 To complete the look wood front doors were installed custom made to blend in with the 1920’s neighborhood and set the mood for this simple, elegant home. 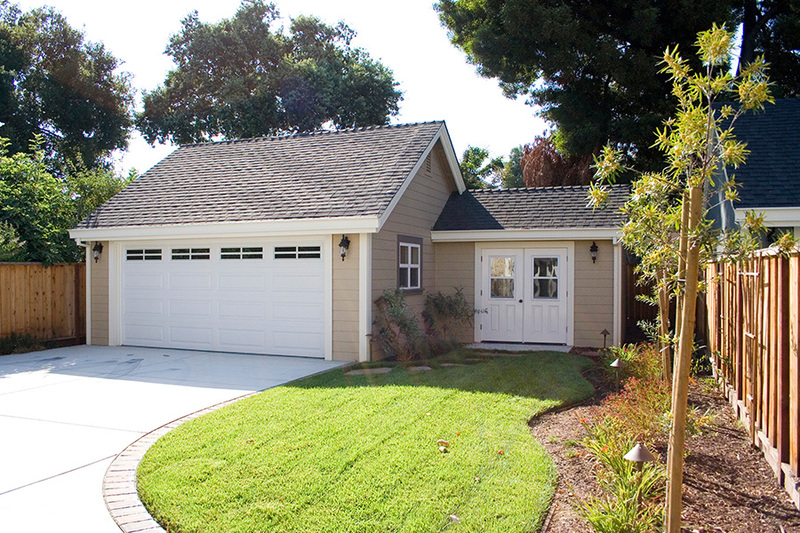 Brand new garages with workshops at the back of the property that match the house, driveways and landscaping upped the value of these beauties for this developer couple and doubled their investment. 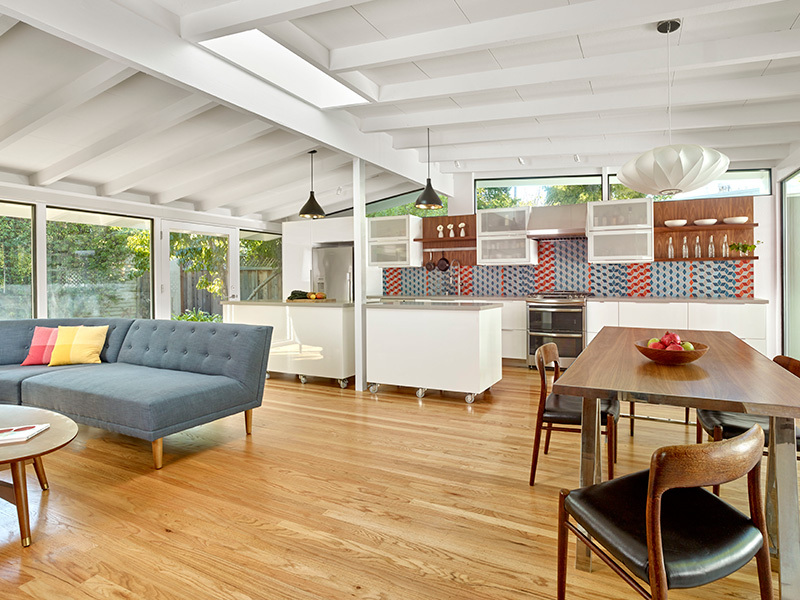 A small bungalow in Palo Alto on a busy street did not work at all for this family of five. 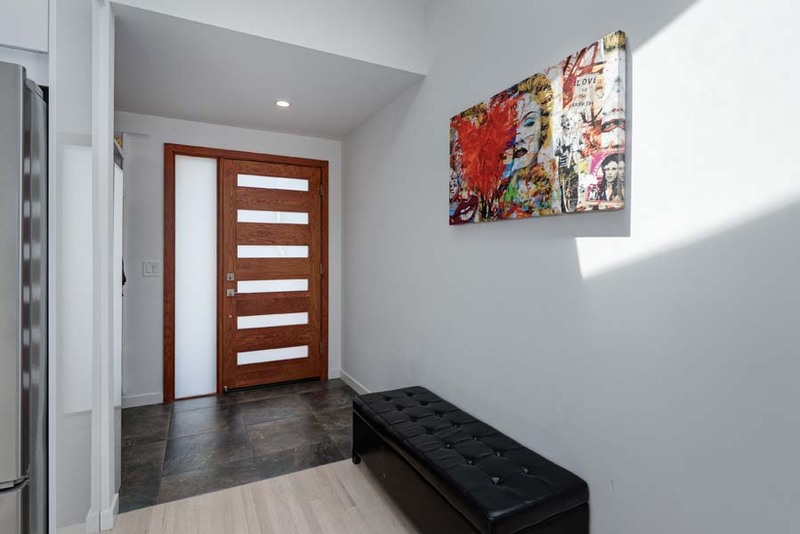 Preferring a front entry on the quiet side street required changing the address with the city. 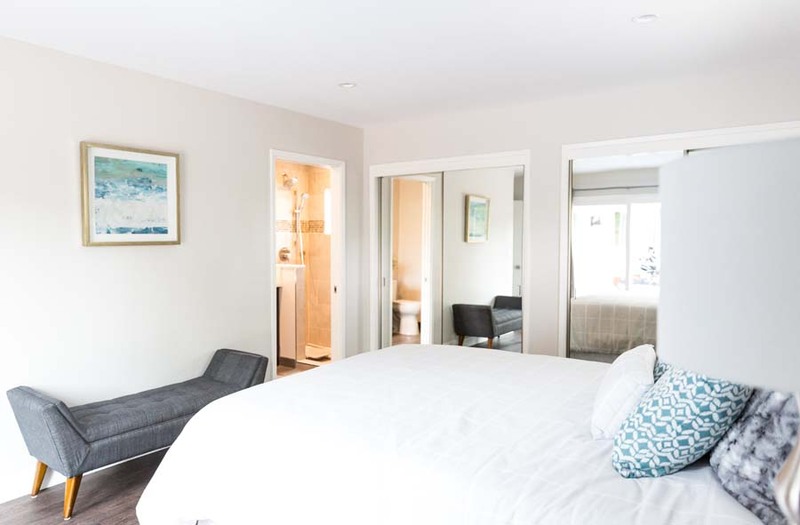 Upgrading from a 3 bedroom, 1 bath house to a 4 bedroom, 2 & ½ bath house with additional living space, to accommodate extended family gatherings and modern upgrades, required 8 months of construction. 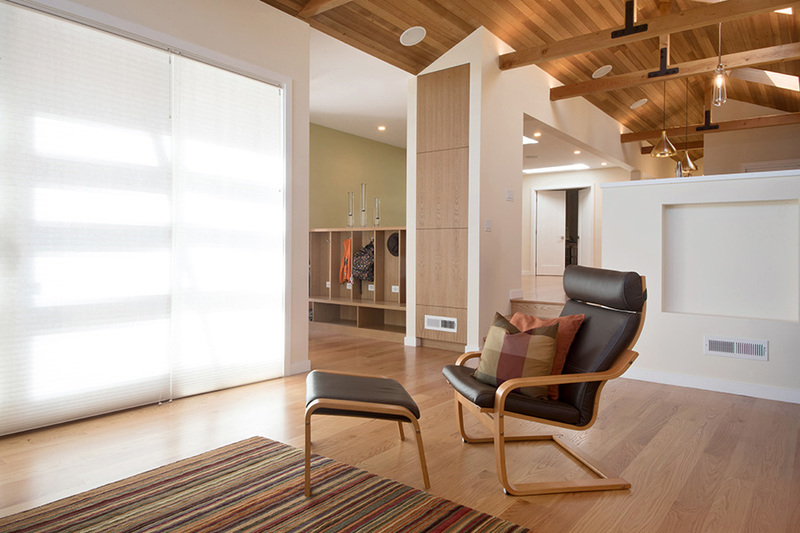 Everything was upgraded as this home was taken down to the studs. 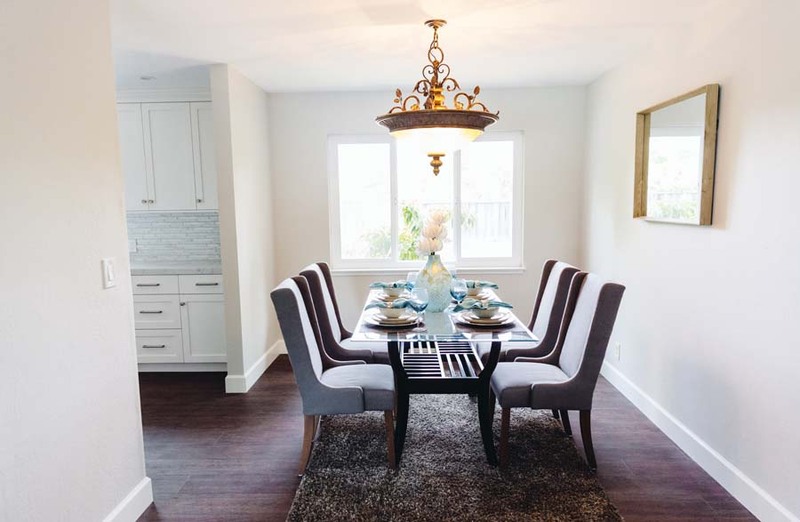 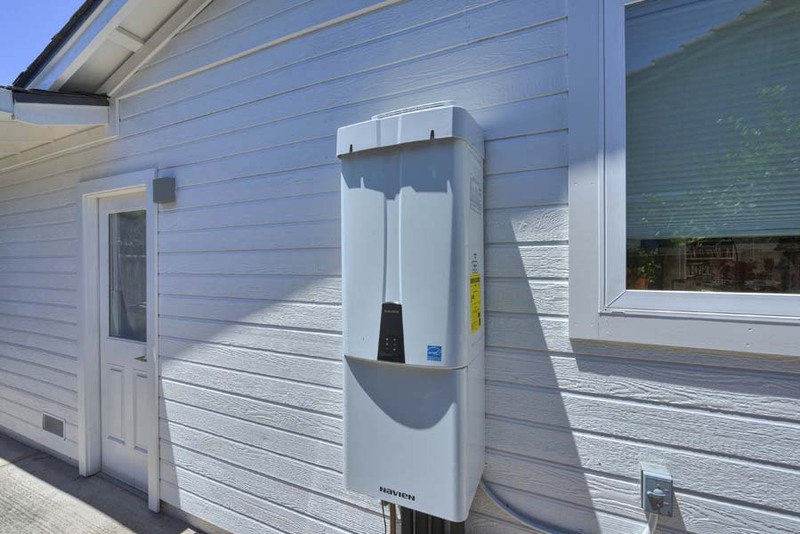 Extra living space was added, a new garage built and energy efficient upgrades (windows, doors, insulation, heater, appliances, water heater) and up to date technologies (charging stations for all family members, wired cable and internet) were the foundation of this whole house remodel. 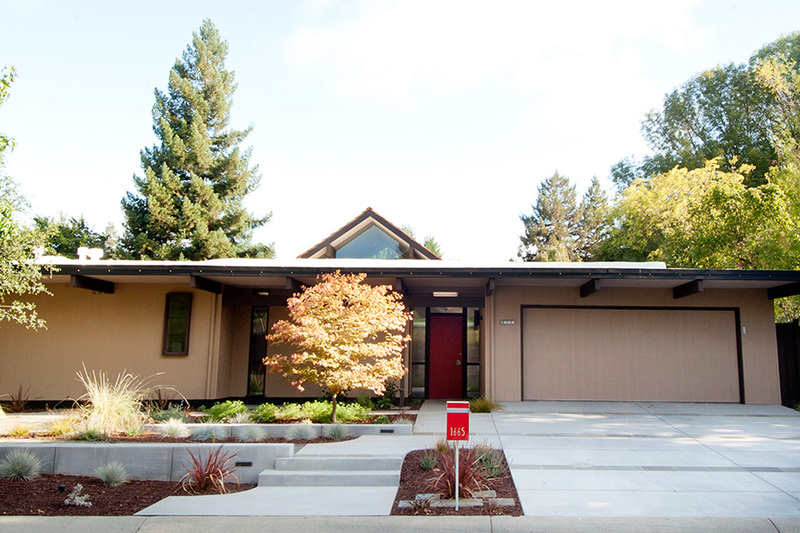 The design was to be more contemporary and still fit into the neighborhood, where some of Palo Alto’s greats grew up. 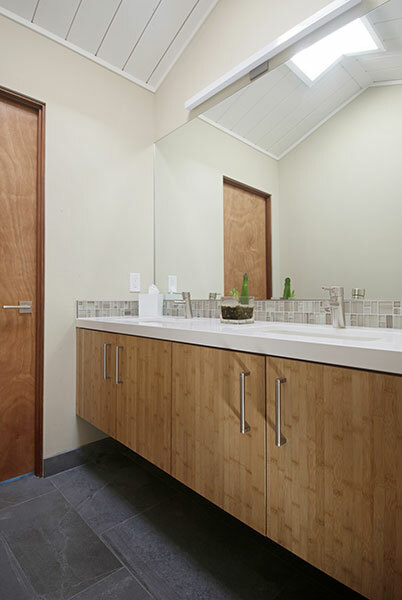 Stucco finish with cedar plank accents helped to combine different finishes of the original era. 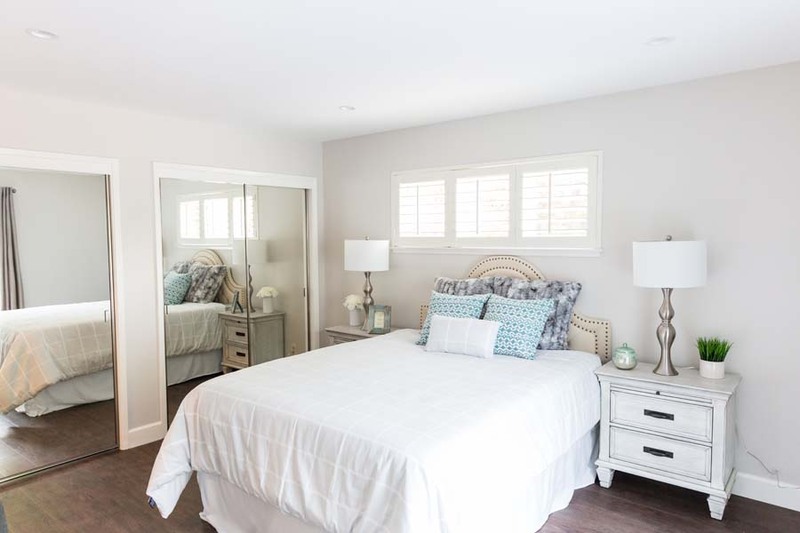 The interior was all custom for this family’s forever house; custom cabinets and woodworking, hardwood floors, custom tile, Caesarstone tops, plenty of storage and even a transitional room to be used as a guest room, a playroom or …for a new baby(?). 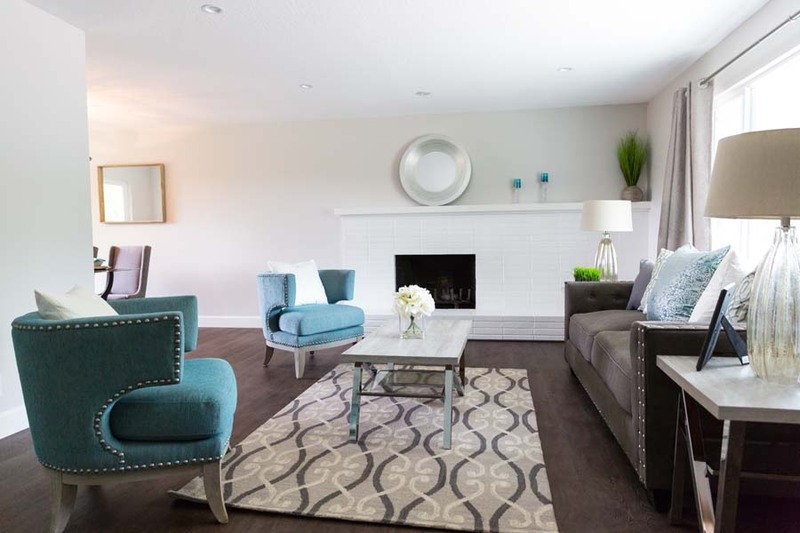 Everything they could think of for the home to grow with the family. 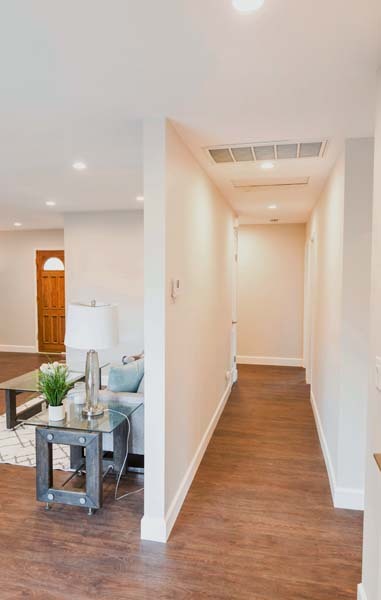 To use all of this corner lot efficiently, due to the size of this extended family and the events hosted at this home, was imperative. 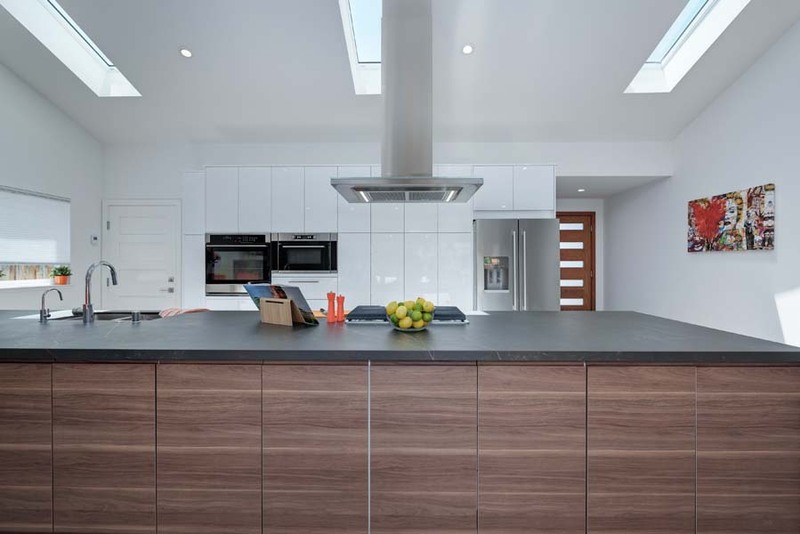 The garage was re-located (with more storage added), new relaxing and barbeque areas were created and a play area for the kids was installed. 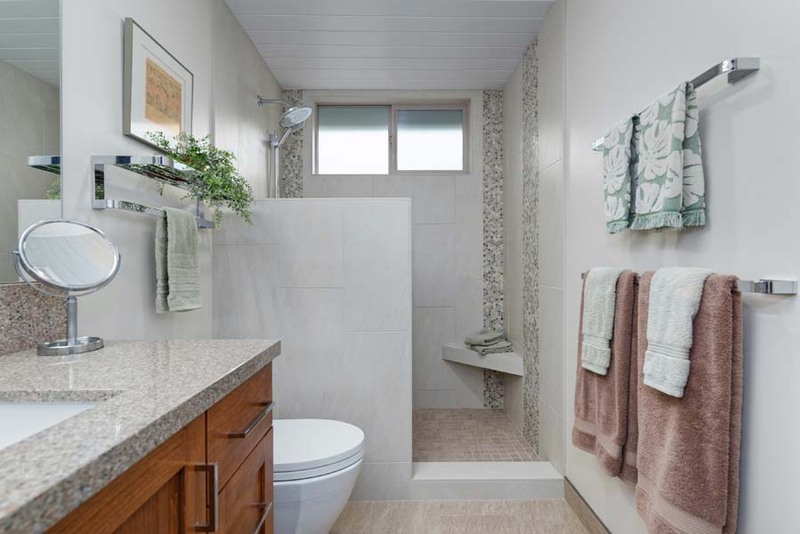 The tight spaces created by the segmented style of this Mackey home gave these owners a lot of small spaces to live in. 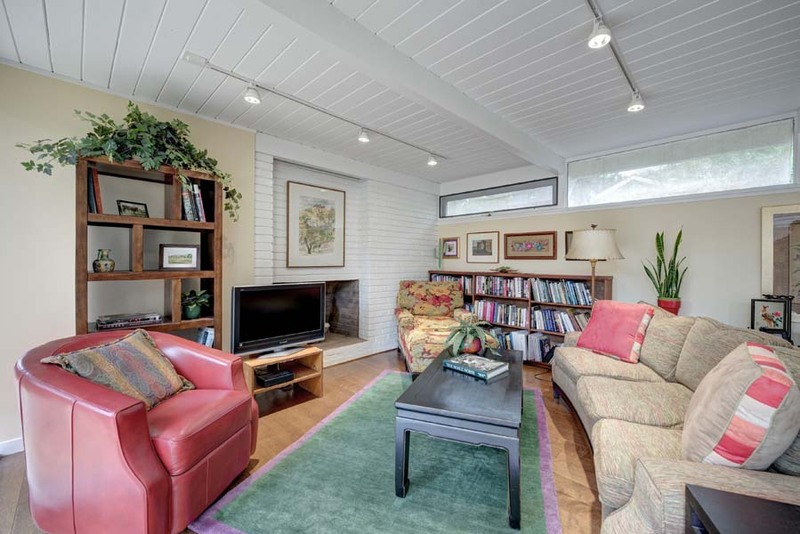 They loved the indoor-outdoor style of their home but needed more room. 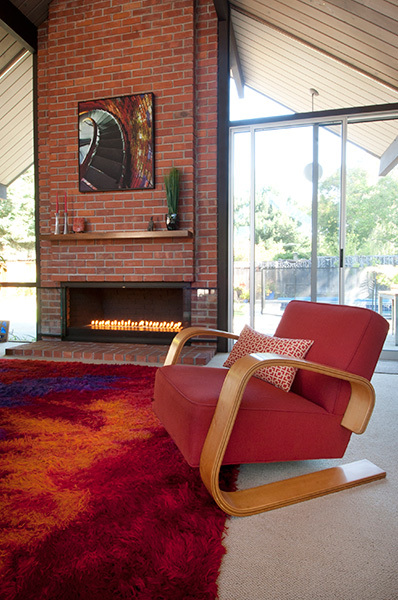 The interior was opened up by removing a center wall and fireplace. 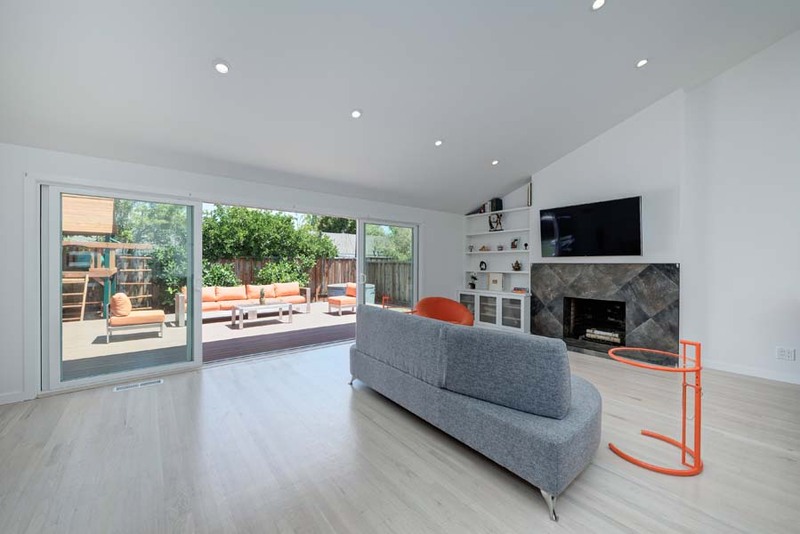 Full windows and glass doors at the front and the back of the house further extended, visually, the living space of this home and created a bright, open space. 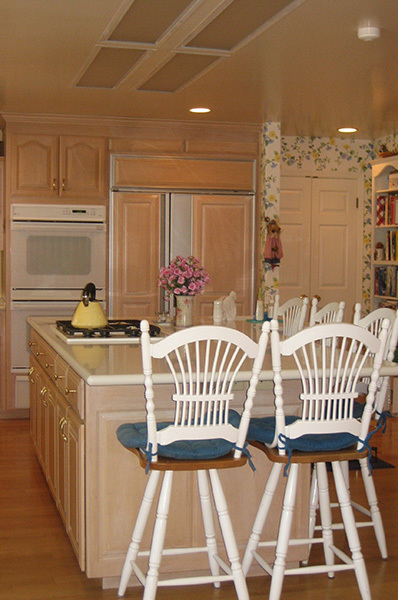 The kitchen was shifted to one side and islands on wheels offered many different layout possibilities. 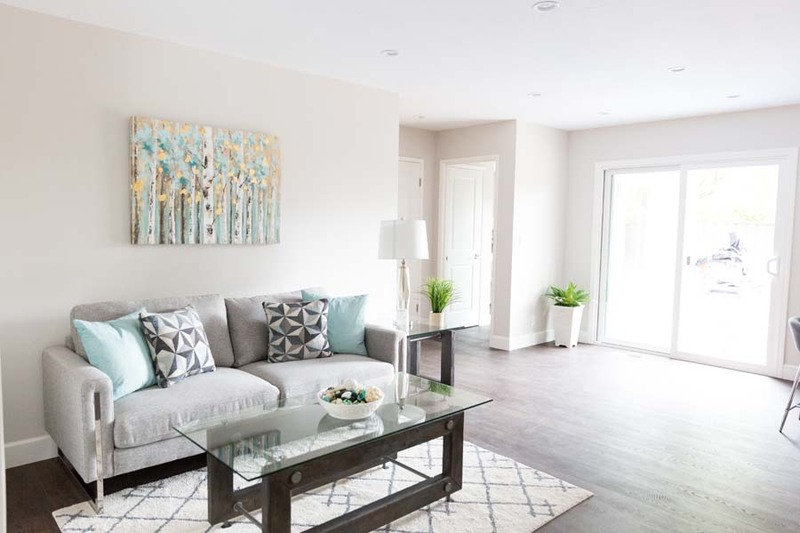 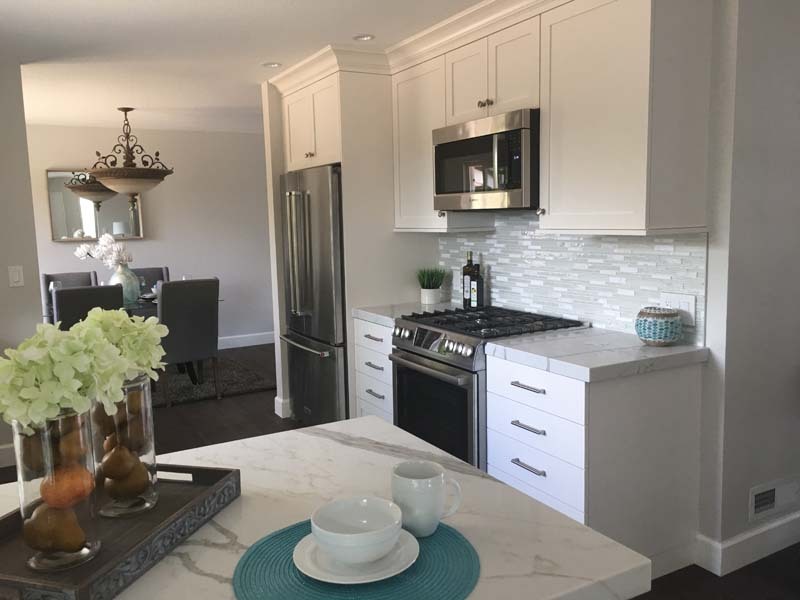 White IKEA cabinets, colorful mosaic tiles, and walnut accents brightened the area and tied it into the living space by blending easily with the custom walnut built-ins (which provided hidden storage and served as furniture). 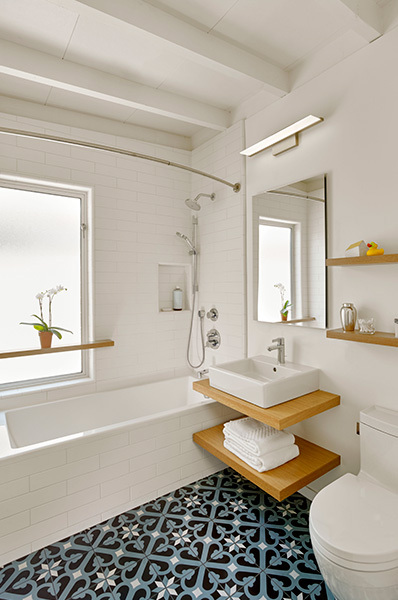 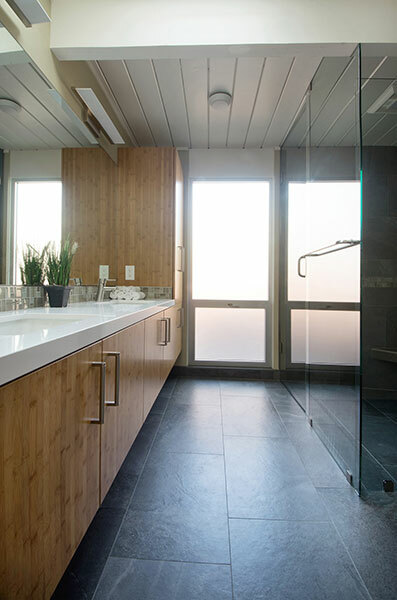 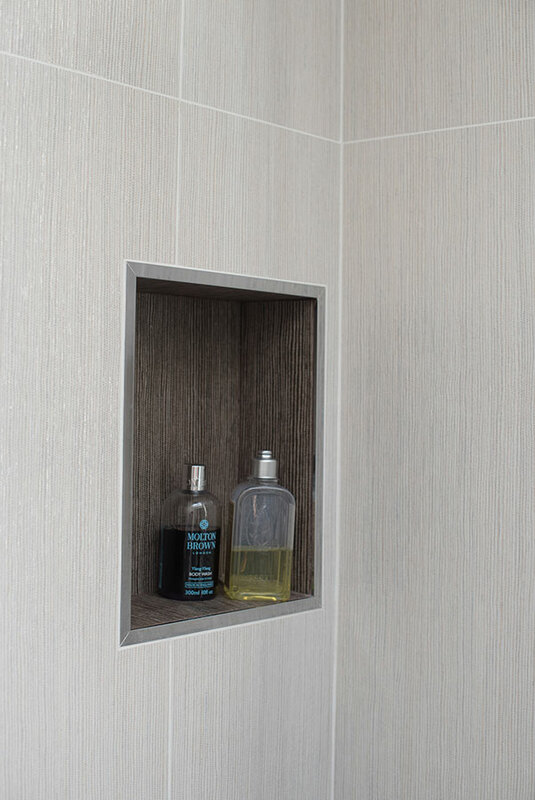 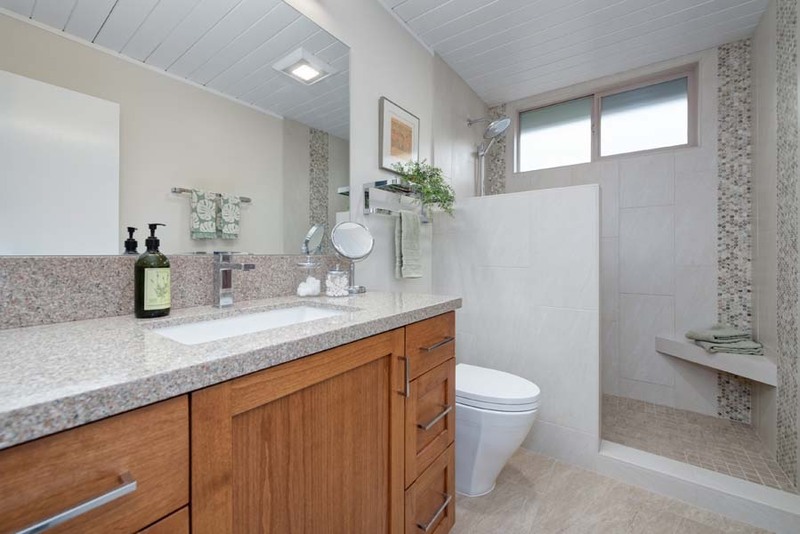 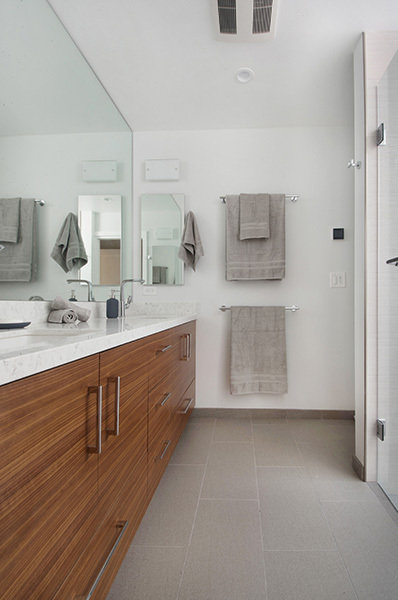 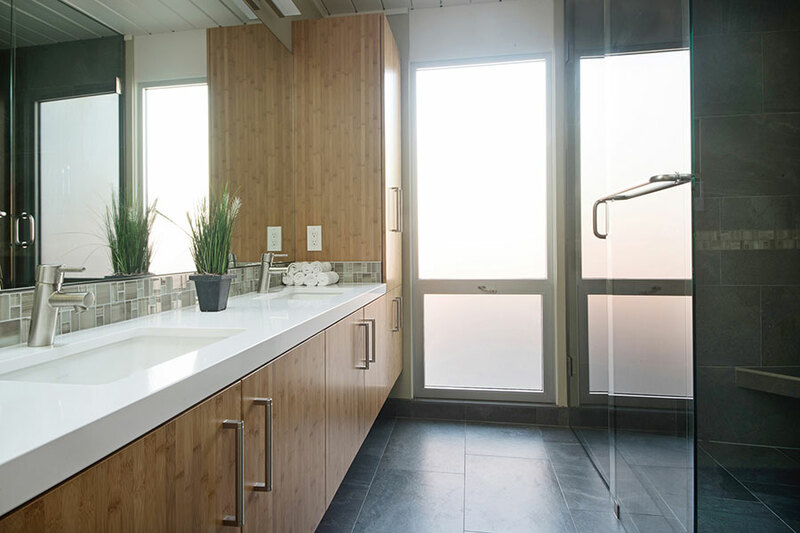 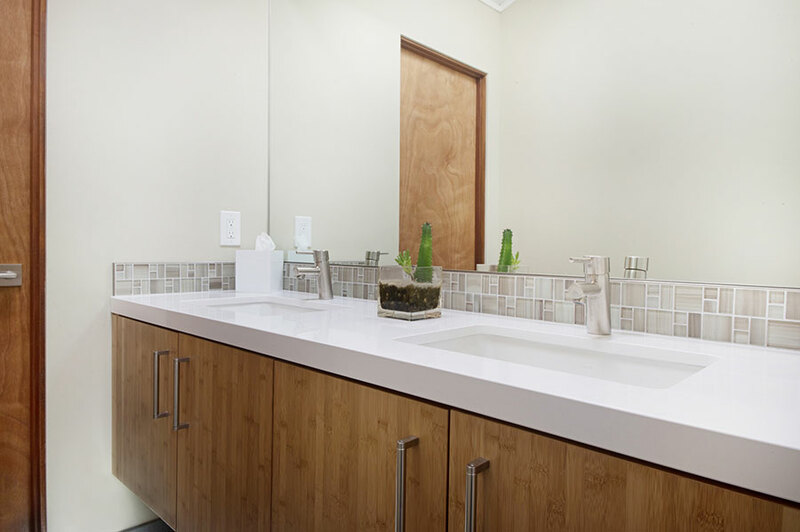 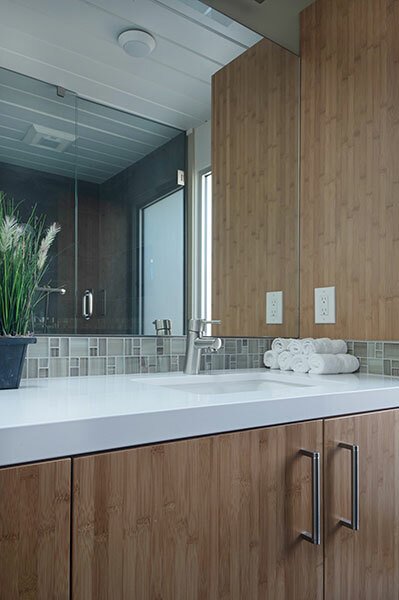 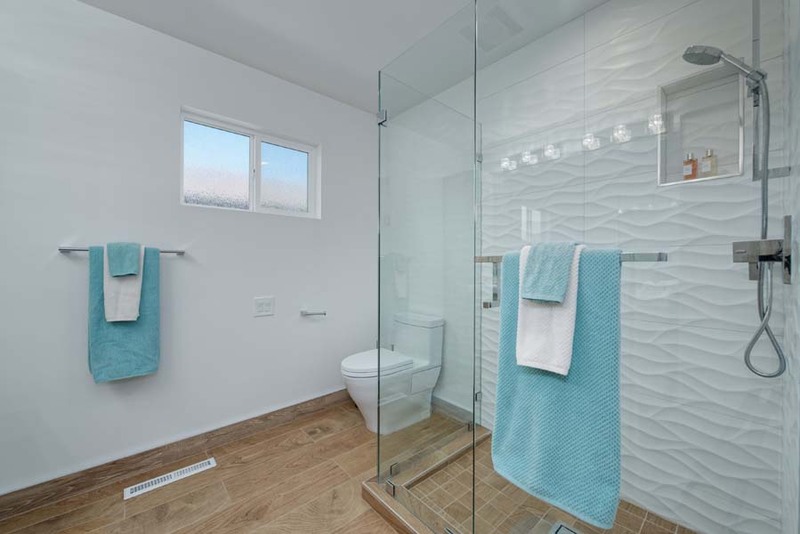 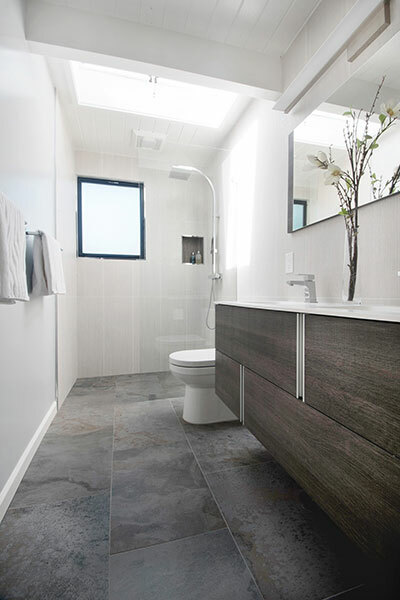 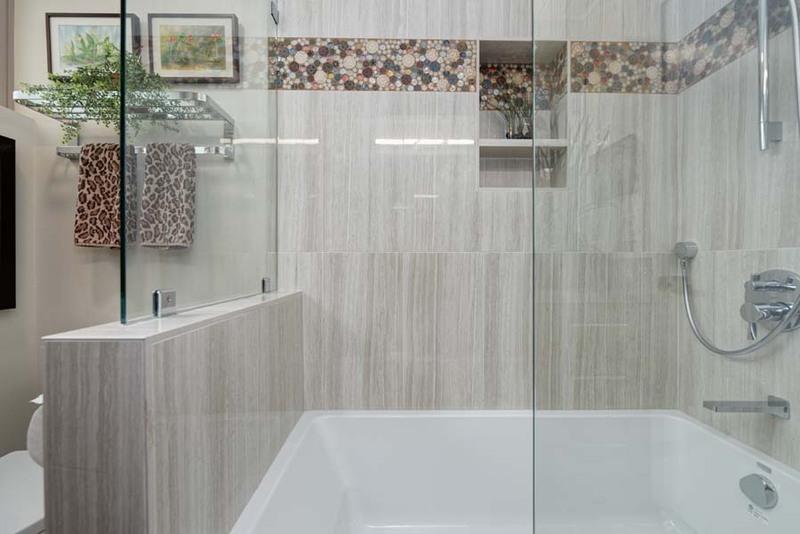 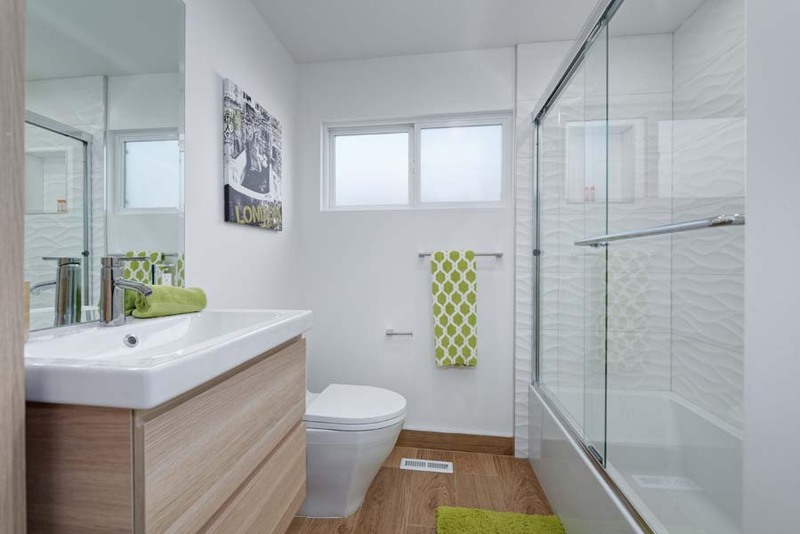 The bathroom was given an updated modern look with wood accents and floating cabinet and decorative cement floor tiles. 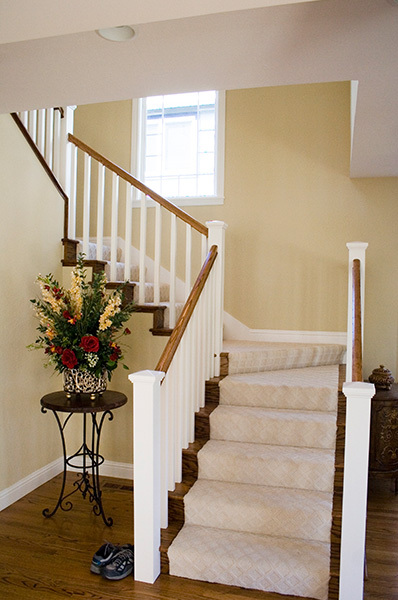 New wood floors and paint throughout completed this makeover. 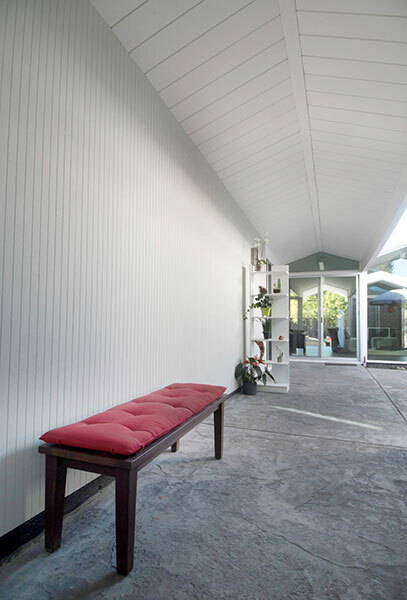 Wood decks were installed around the house to allowing easy movement between the interior and exterior to capitalize on space and create nice floor for indoor/outdoor living. 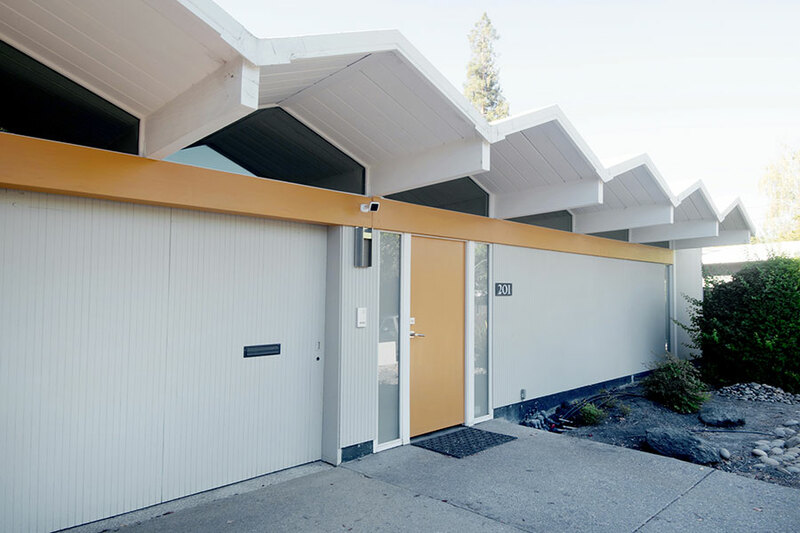 One of 5 unique Eichler’s in the South Bay these homeowners had not done a thing while the family was growing up. 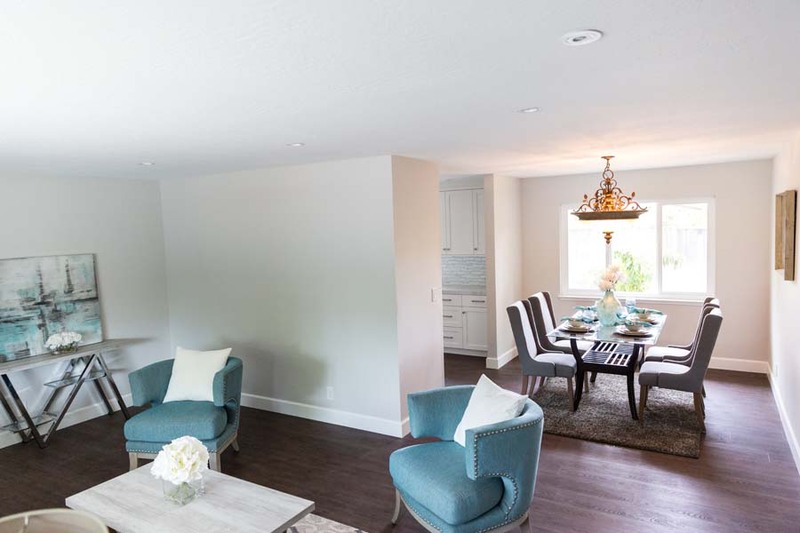 With the second half of their life approaching and grandkids and family visiting they decided to remodel the entire house. 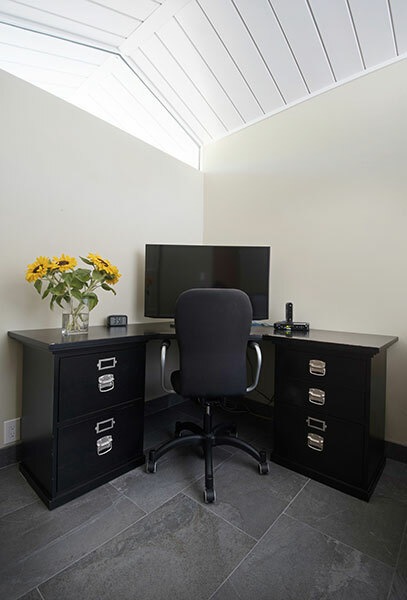 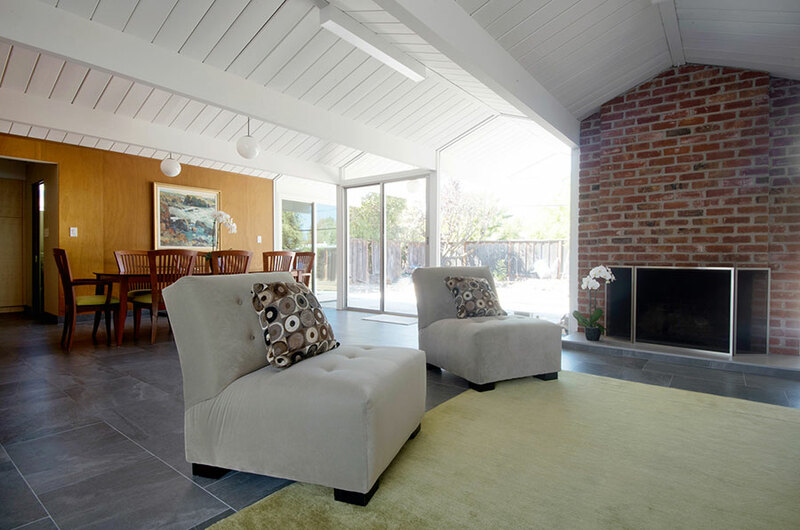 Keeping with the Eichler aesthetic was extremely important to this couple, while designing the interior finishes as well as upgrading all the systems in the house (electrical, plumbing, windows, heating, roofing). 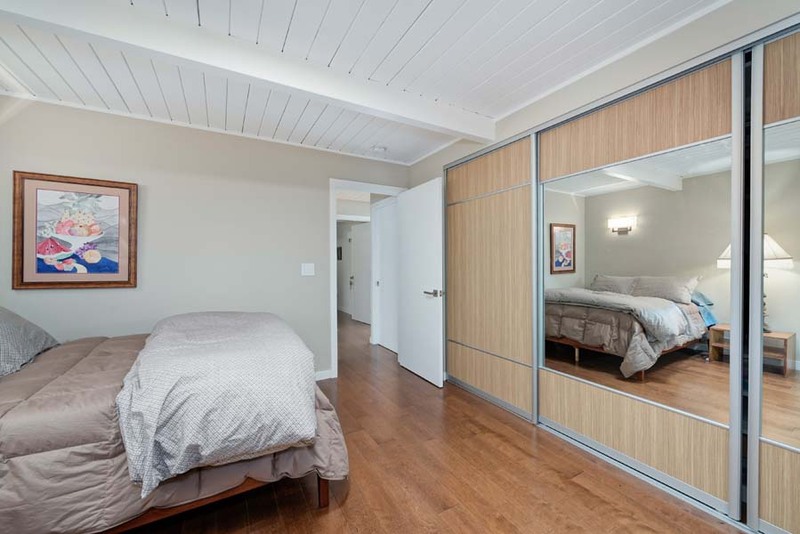 Reusing the original Eichler globes, refurbishing some of the original paneling and cleaning the existing closet doors helped to blend the past with the future in this update. 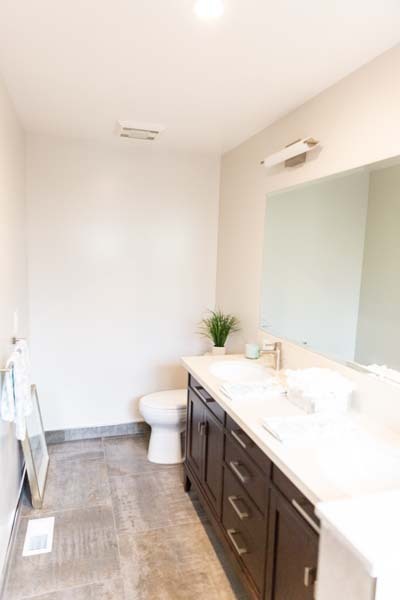 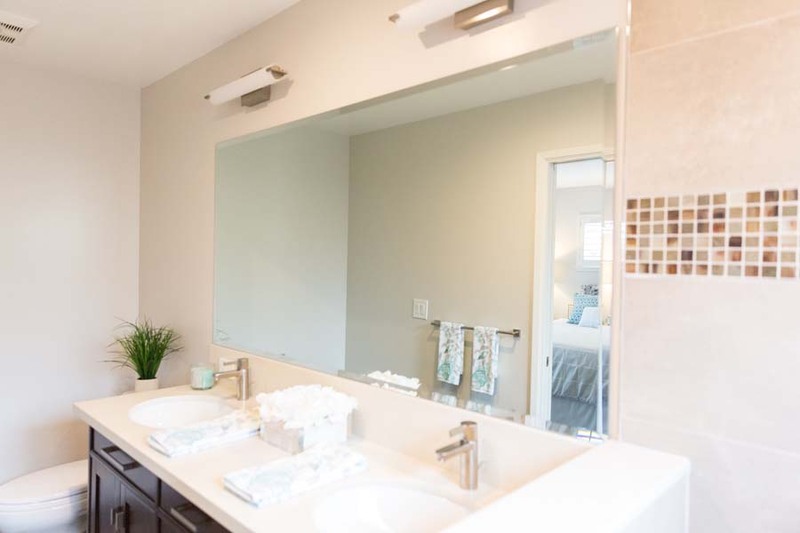 All new tile, in the bathrooms, kitchen and laundry room, custom cabinets and new Dekton and Caesarstone tops in the kitchen, living room and bathroom create a serene and modern clean look. 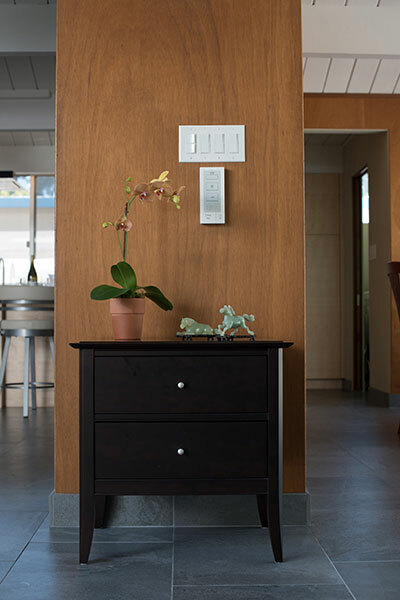 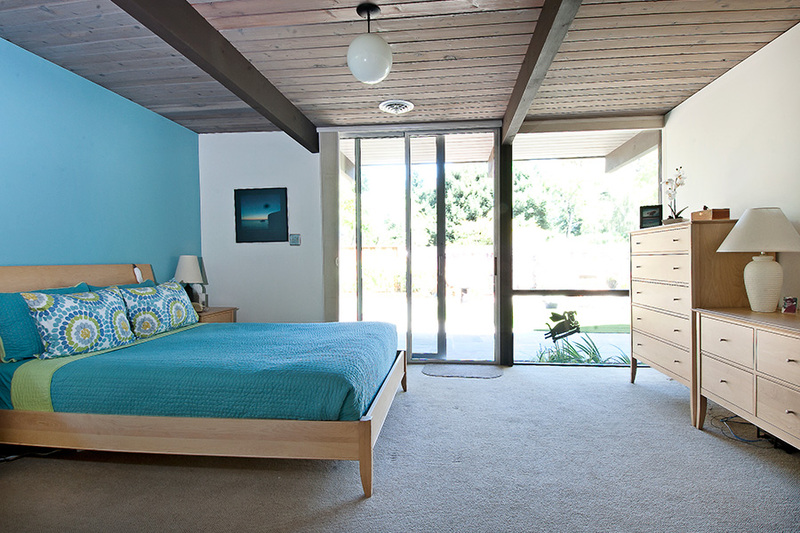 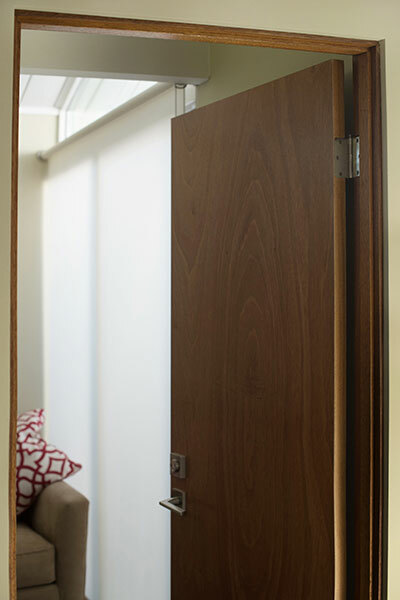 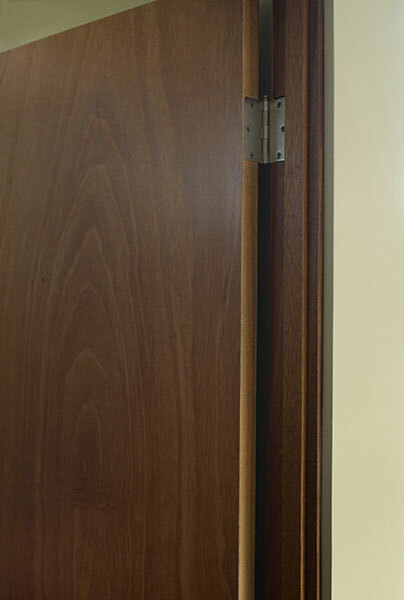 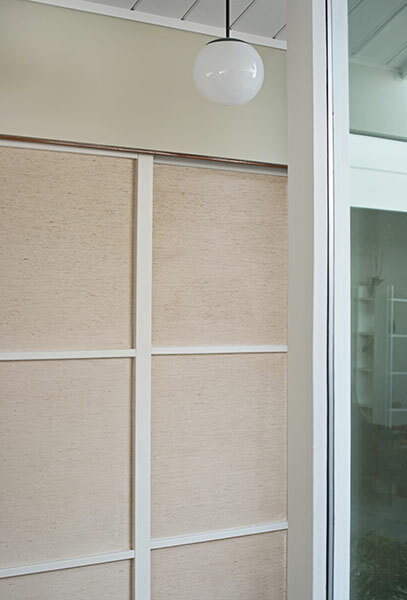 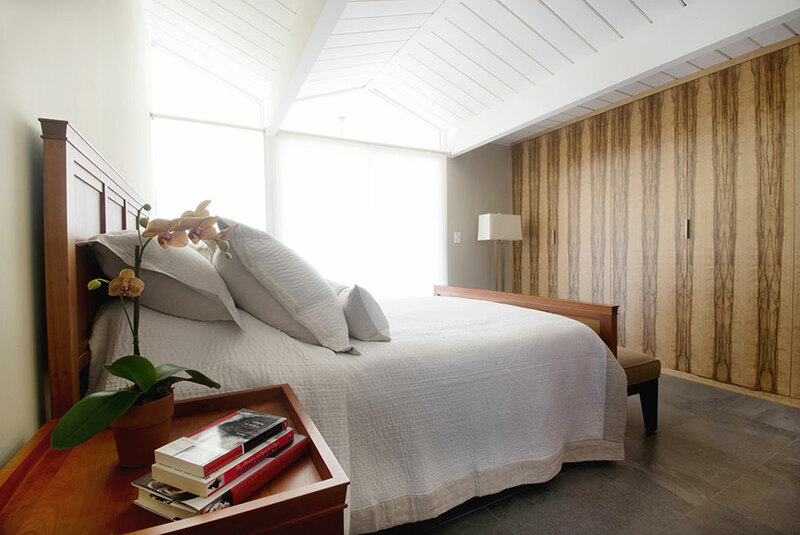 Special features include custom exotic wood for the master bedroom closet and of course some pops of Eichler colors. 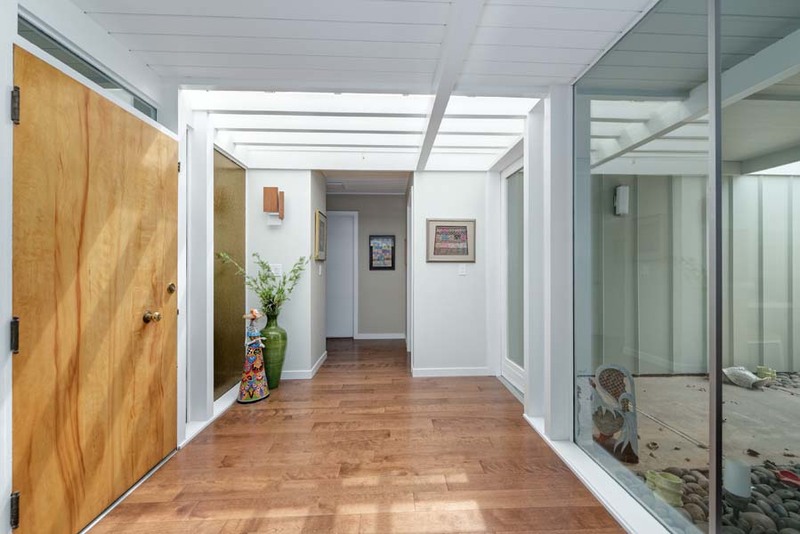 We finished with an epoxy coating on the garage floor and custom wine cabinet/fridge and new door openers for the Eichler sliding doors. 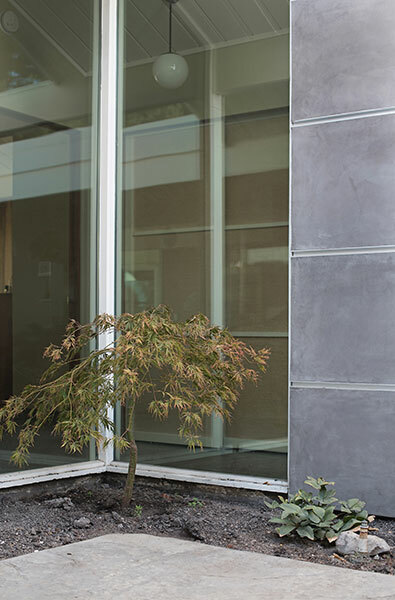 Mission accomplished for this couple going into the next phase of their life. 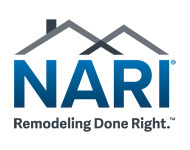 They do not have think about repairs or fixing up the house and are truly enjoying their time with their family. 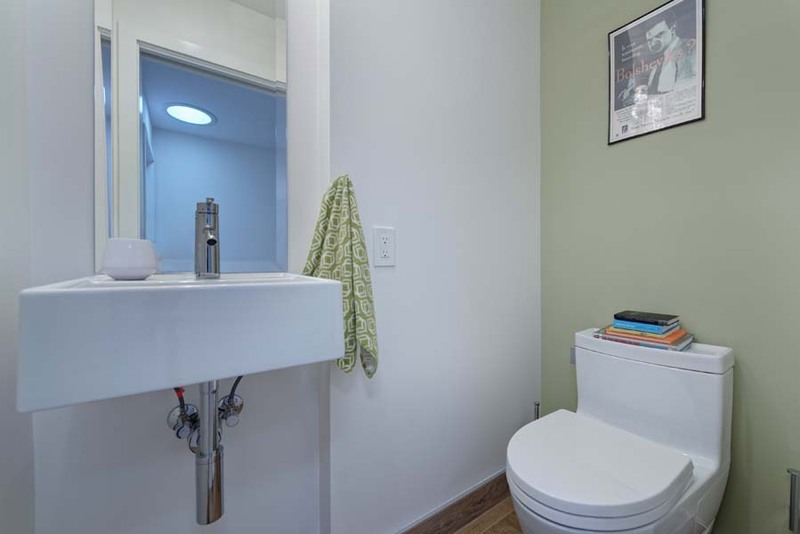 This bathroom had a small vessel sink that was so oddly shaped; the owners called it an airplane bathroom sink. 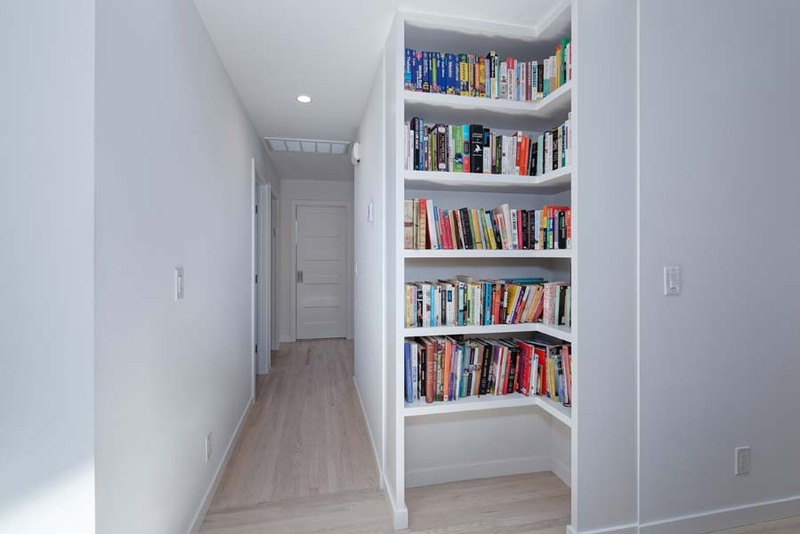 The space was not used efficiently at all and with no storage, the overall space seemed small. 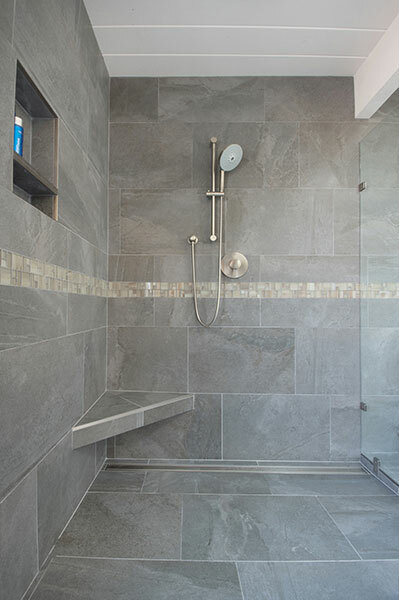 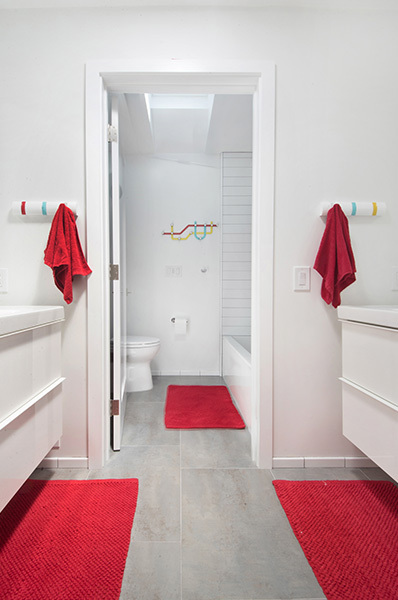 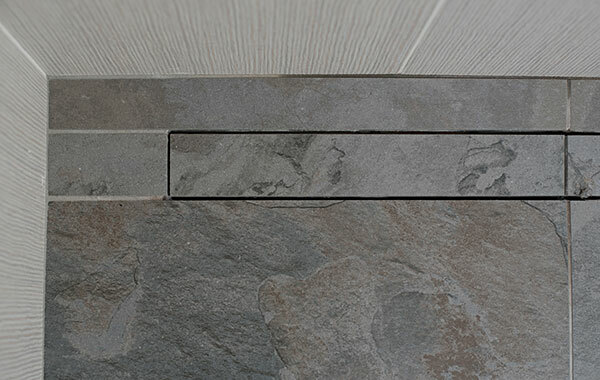 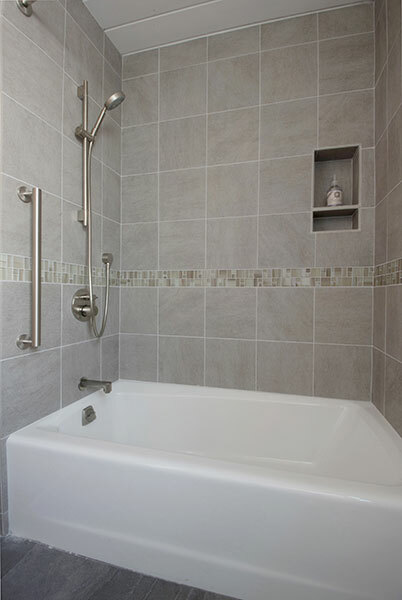 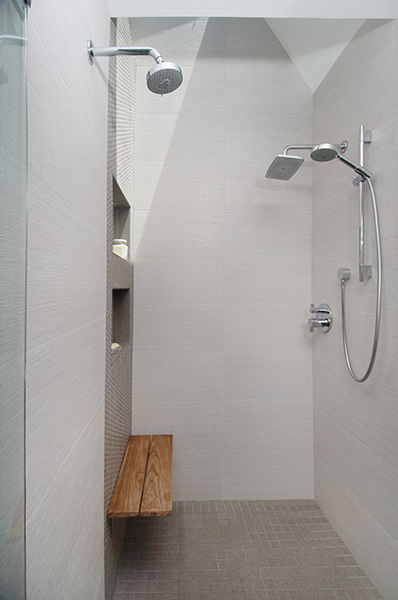 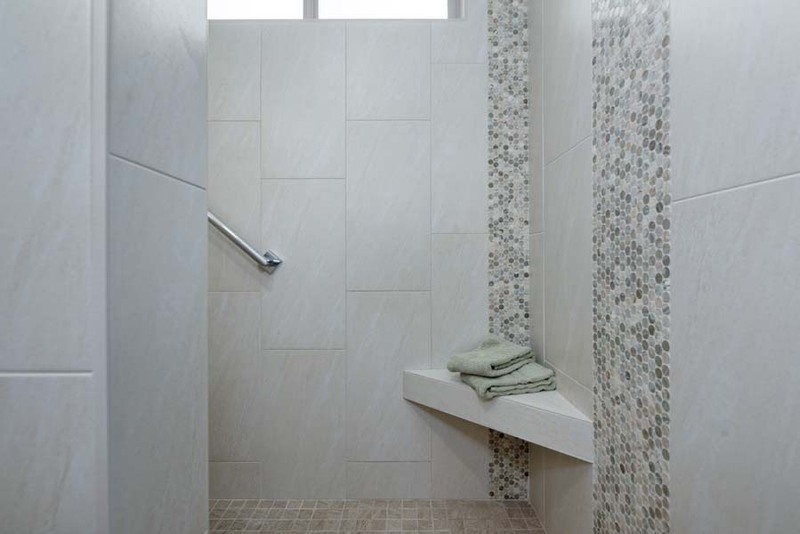 To open up the room, the floor was sloped into a tiled linear drain thus allowing for no door. 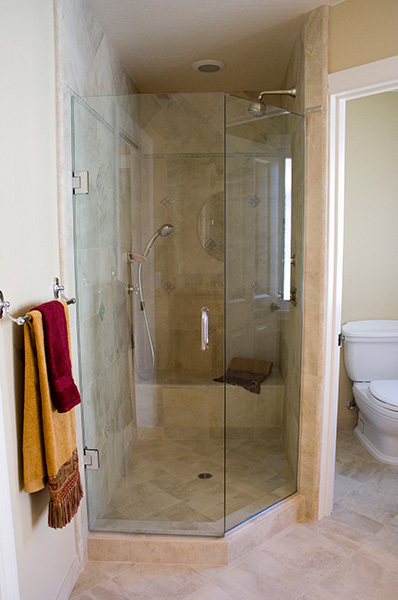 Using only a single pane of clear glass really expands this space. 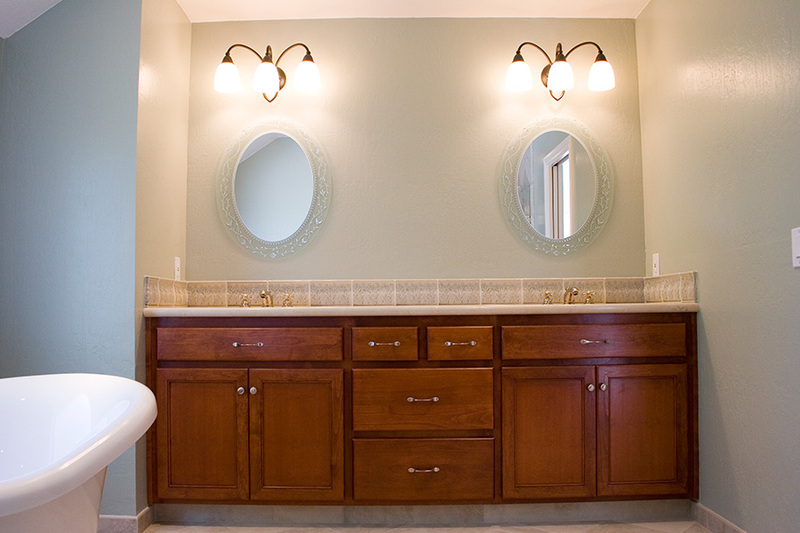 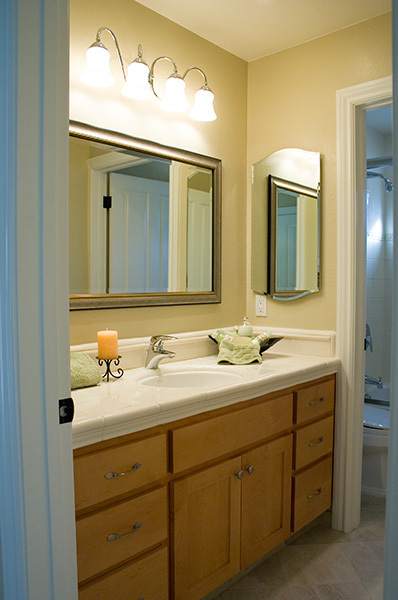 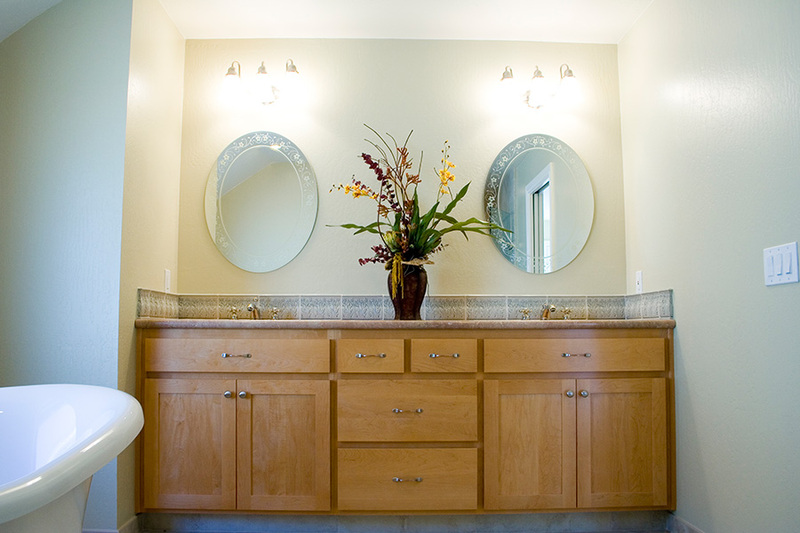 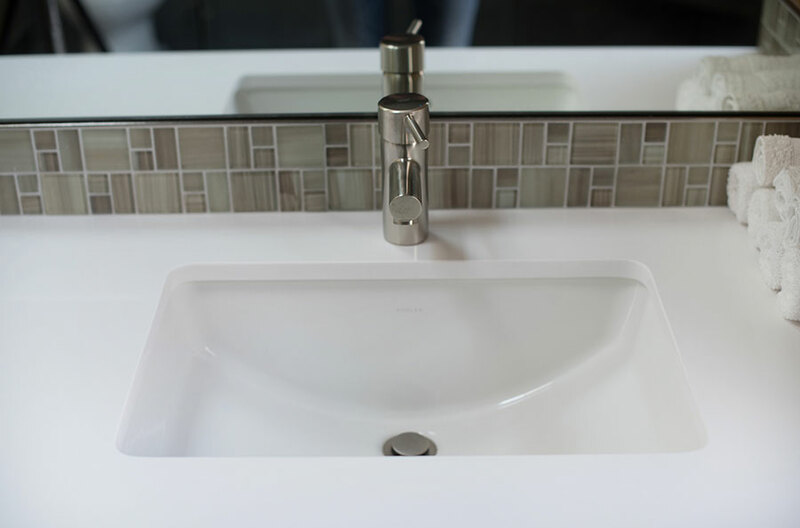 A large vanity now accommodates 2 sinks and storage this, along with a slim storage cabinet in the corner, now allow all of the owner’s items to be out of sight and helps the room to feel non-cluttered and serene. 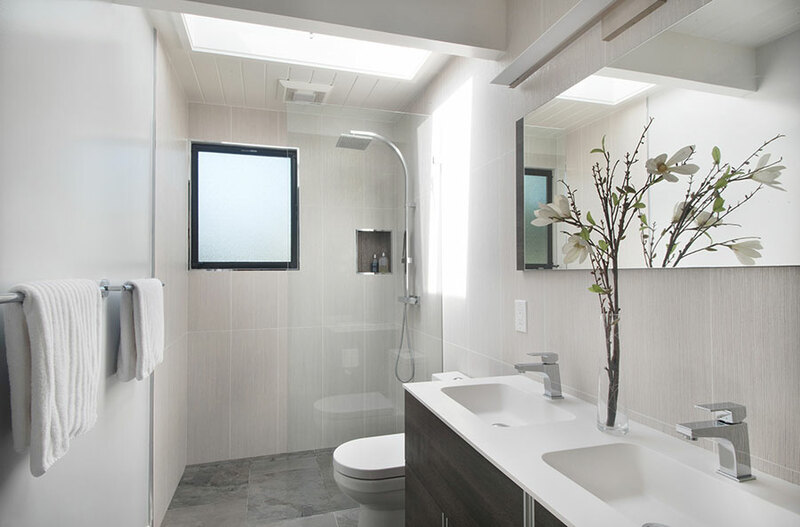 Adding to the peaceful feeling in this Master Bath is the use of large tiles, a simple color scheme, tiling one wall completely (behind the sink), clean tops and streamlined faucets and lights. 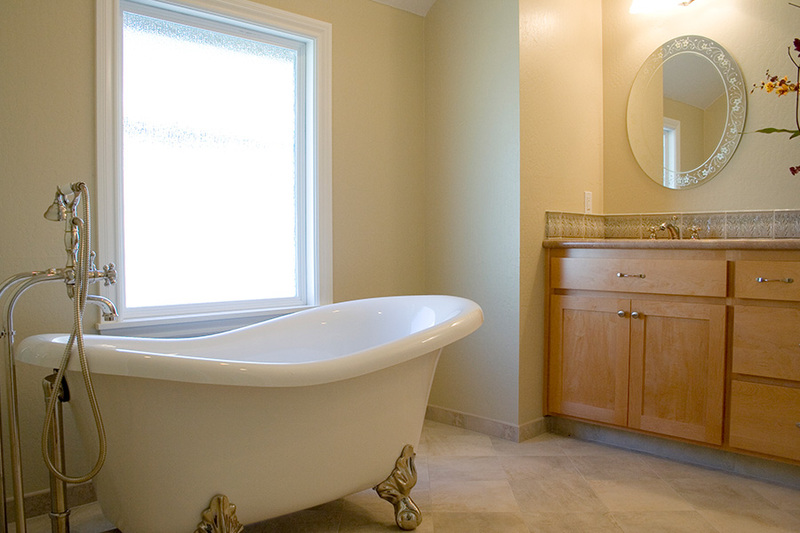 A relaxing place now, where you want to spend time to get it away from it all... no plane required! 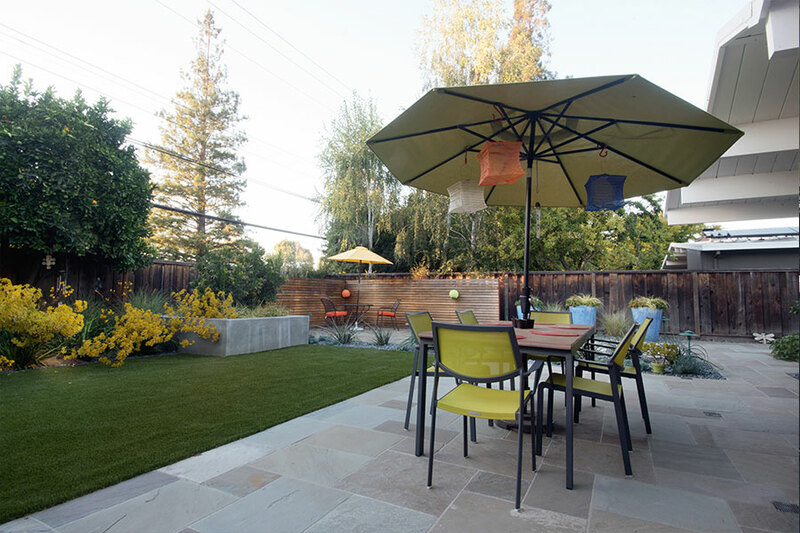 After an extensive whole house renovation this Palo Alto couple wanted to update their 40+ year old yard with new serene landscaping and specialized area’s for their private time as well as entertaining. 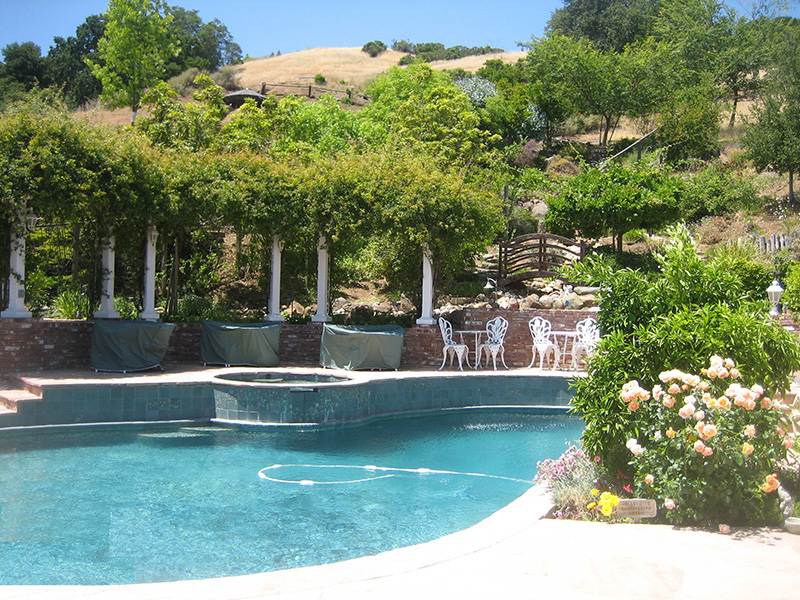 The pool’s usefulness had been long gone since the children had left home, so to reclaim this huge area the pool was removed. 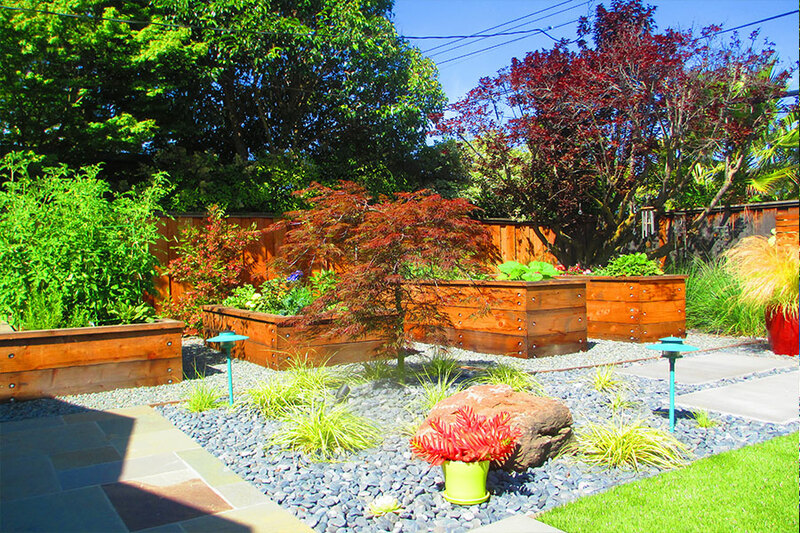 Today this couple have a beautiful escape from their busy lives and spend time tending to their garden (planting boxes provide edibles all year long), reading on their private patio (defined by the now popular horizontal fencing) or entertaining their friends and family with an al fresco dinner and bocce ball game. 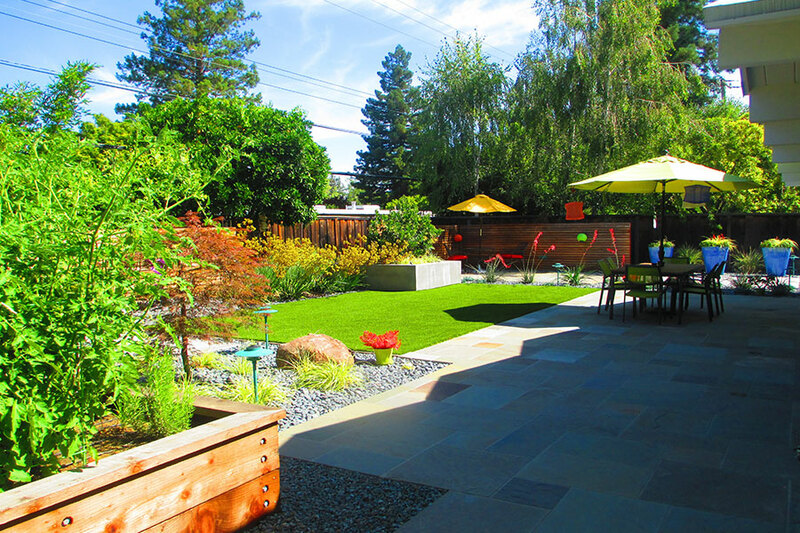 The small lawn, that is man-made and low maintenance, provides some softness in contrast with the hardscape. 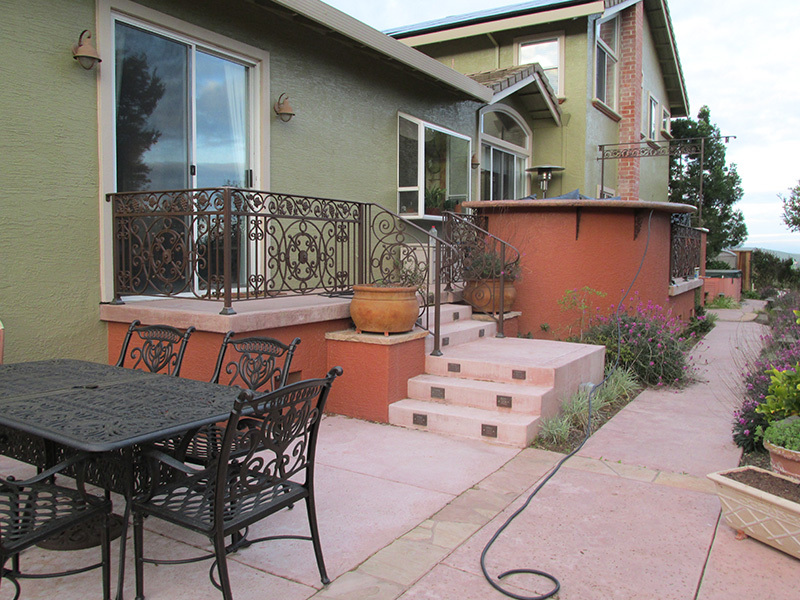 The patios and walkways are covered with colorful stones and specifically placed lighting to accentuate the yards lovely features. 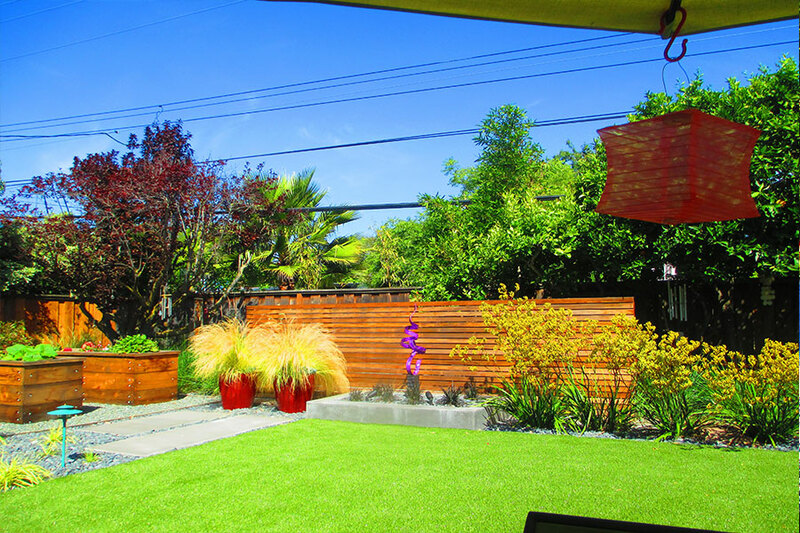 A modern sculpture and vibrant oversized pots and plants add lightness and provide cohesiveness between the living spaces. 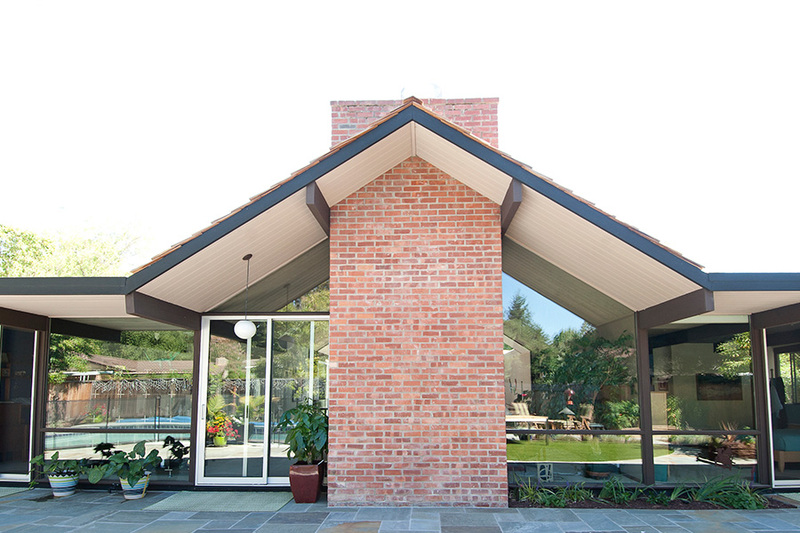 The couple loved the backyard so much that they moved onto fixing up the atrium and front yard. 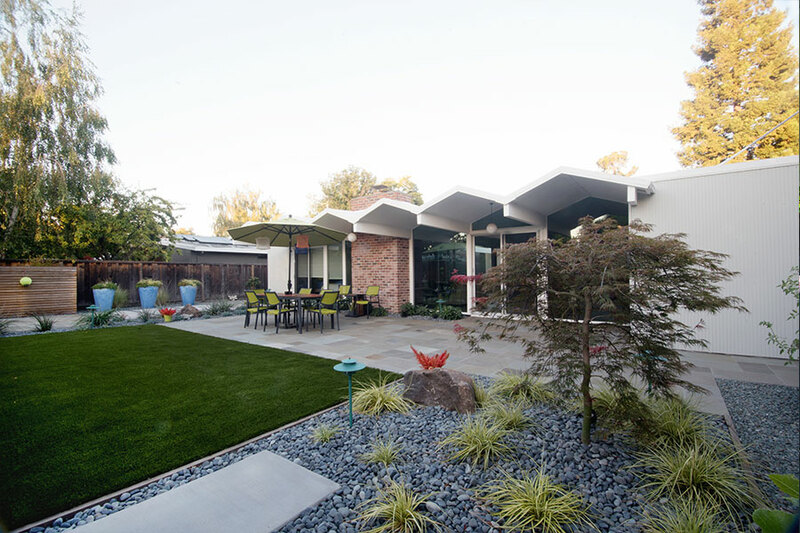 The criteria for the atrium and the front yard was that they had to be modern and clean, fitting the style of the house and very low maintenance. 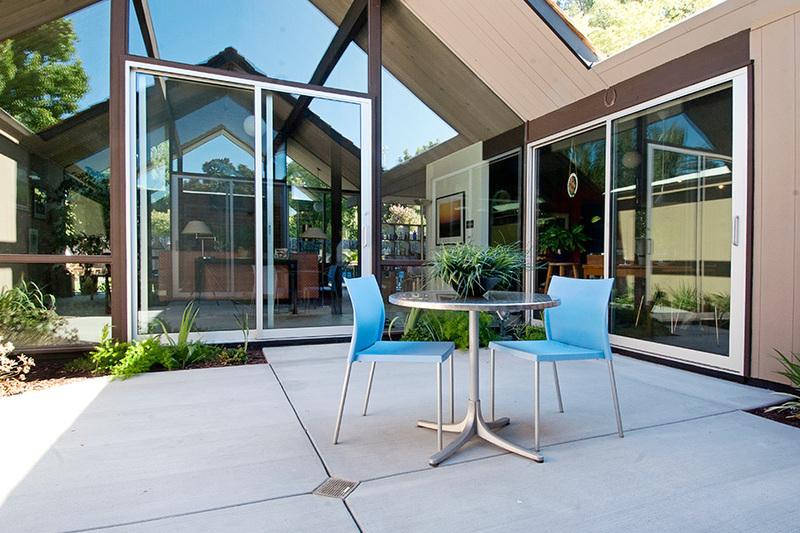 The atrium really extends the indoor/outdoor living that Joseph Eichler was known for with his architecture. 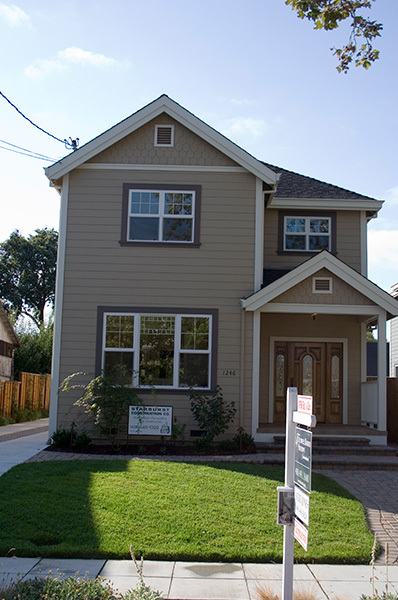 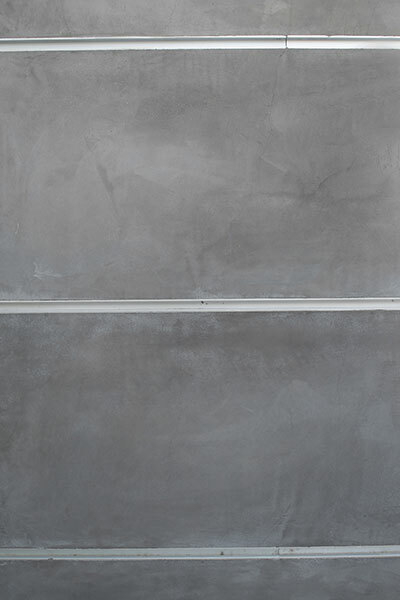 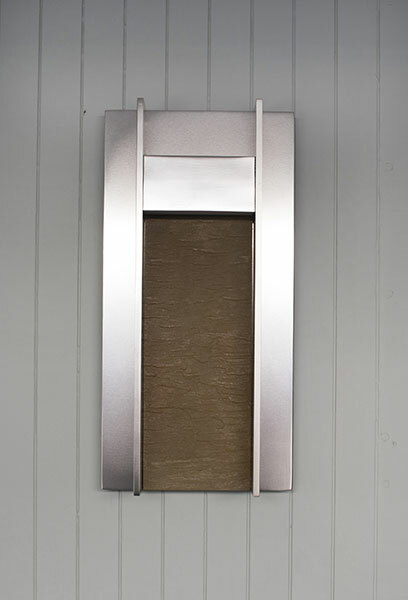 Where deteriorated wood shake once covered a wall, now an upgraded clean stucco finish with classic lines(riglets) will withstand all weather conditions beautifully. 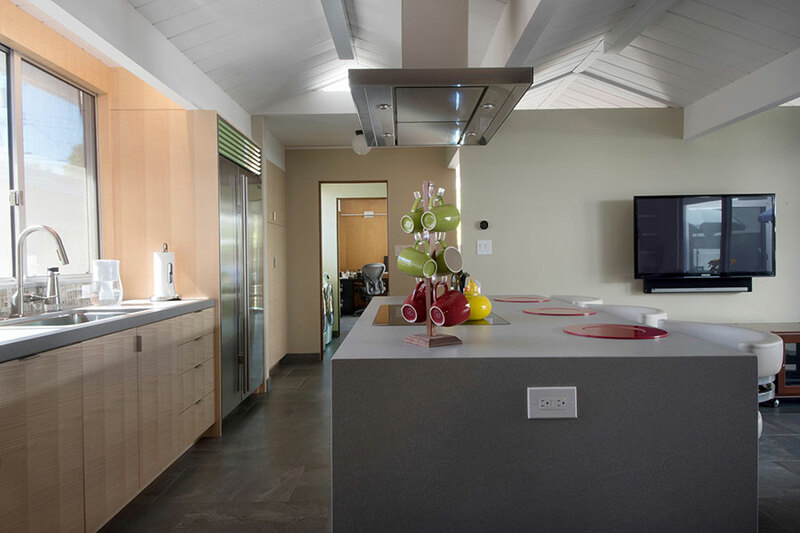 This stucco also suits the interior design of this couples newly renovated Eichler home adding another updated useable area for them. 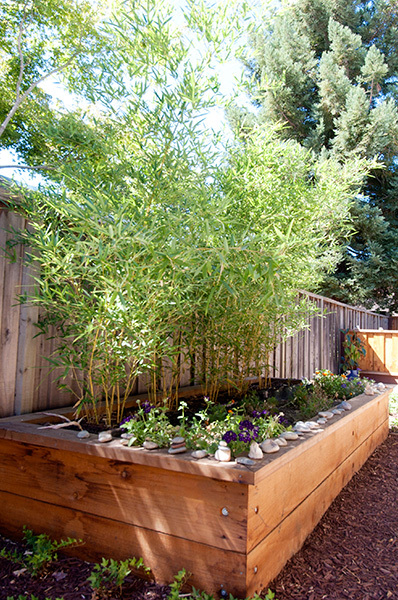 The front yard was a mixture of different plants and wood spacers separating the area into different levels. 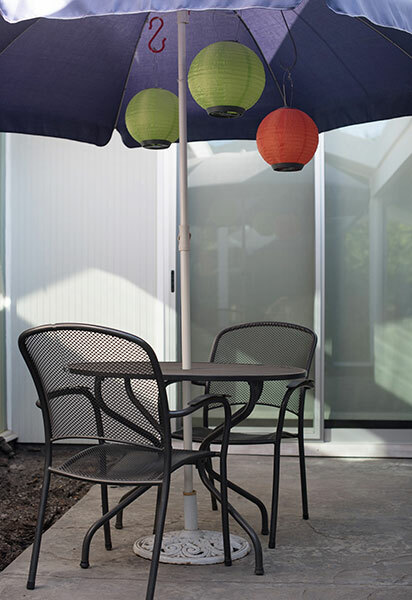 Custom made sheet metal created a more modern look for stacking the yard. 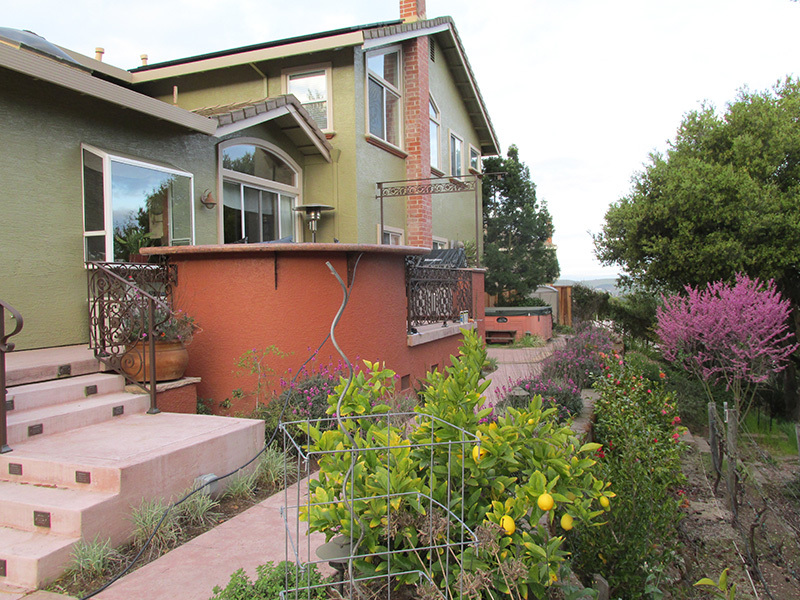 Drip irrigation for ease and water efficiency and new low maintenance plants added the greenery. 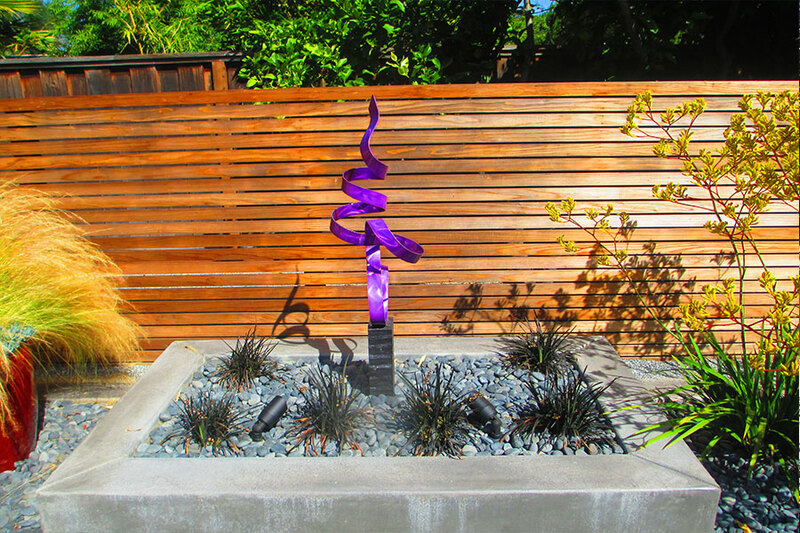 A special focal point was created, that looks like a fire pit, with a medium sized rock and iridescent stones. 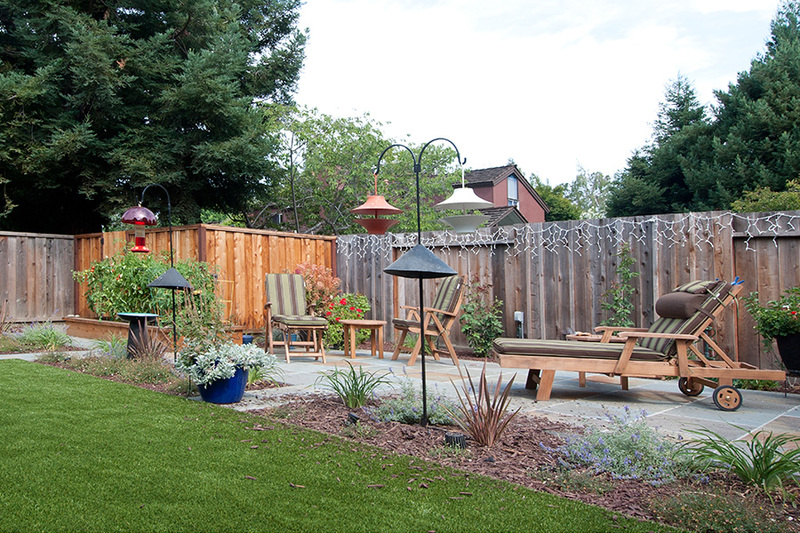 The yard requires no maintenance and will be a sidewalk stopper for the neighbors for many years to come.